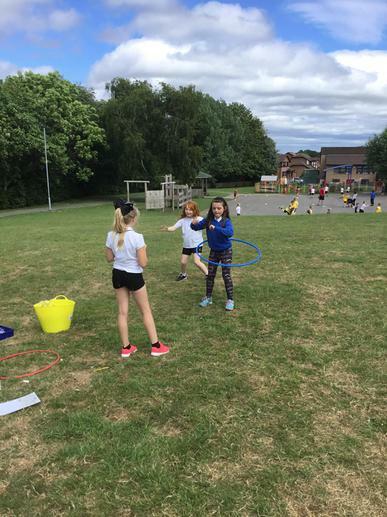 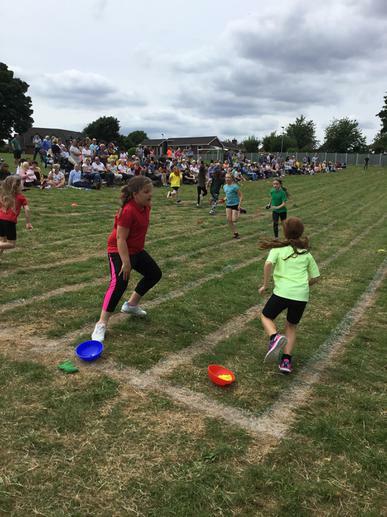 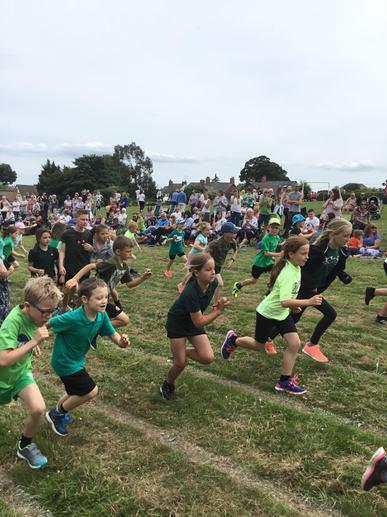 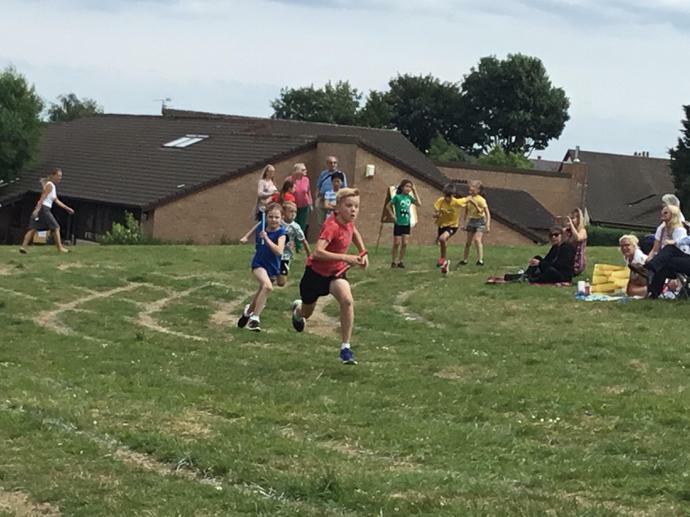 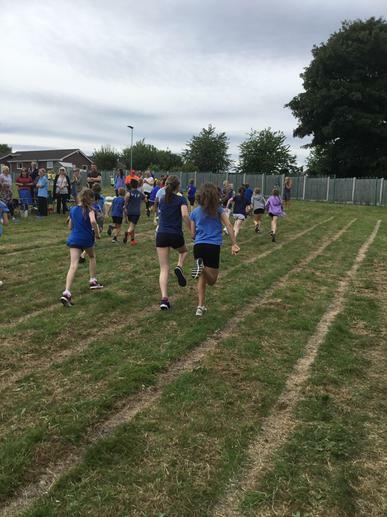 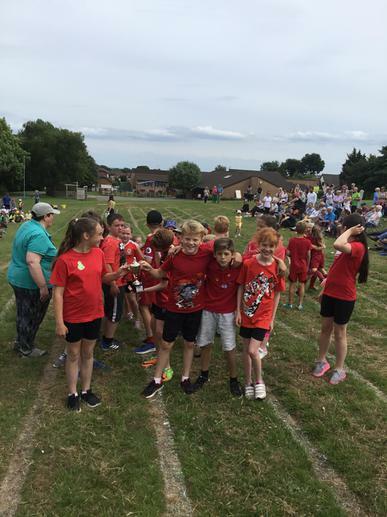 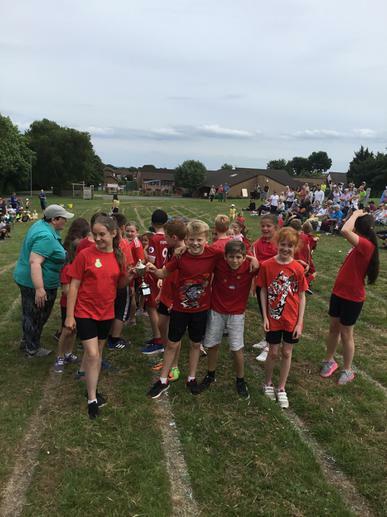 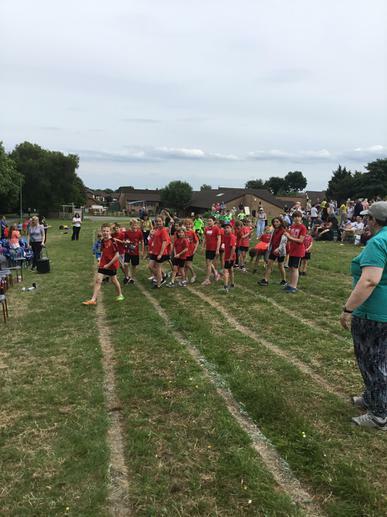 We all thoroughly enjoyed sports day this year and I am very proud of the supportive attitudes that all of the children had. 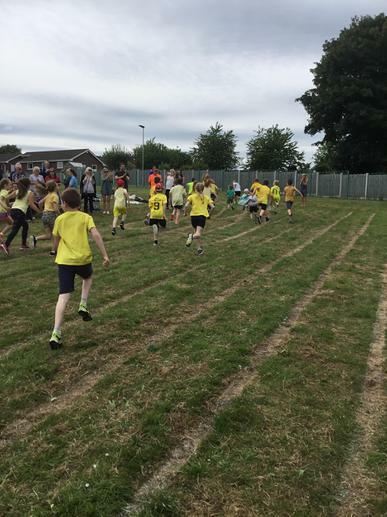 Congratulations to team coch and a great effort by everyone at all of the races! 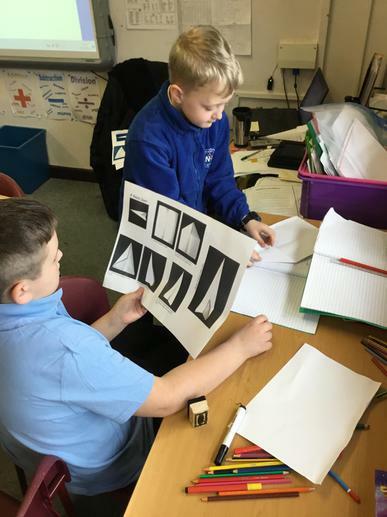 Angles have been the focus of this week's maths. 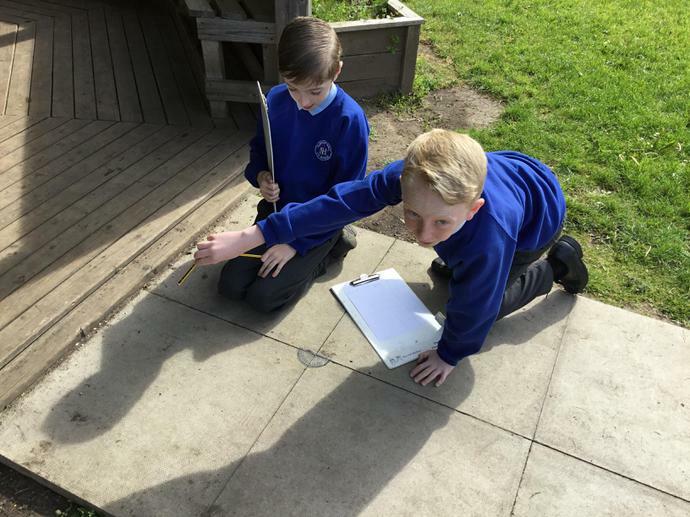 We have learnt how to: identify, classify, measure and draw acute and obtuse angles. 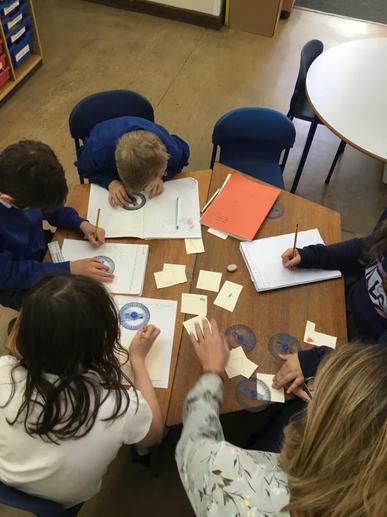 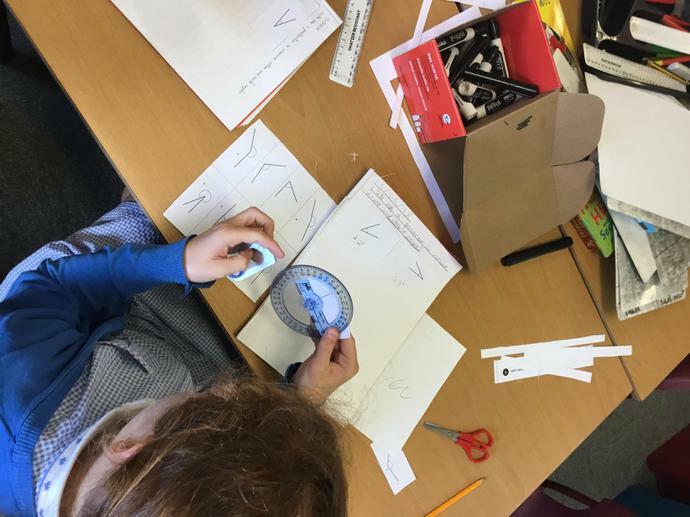 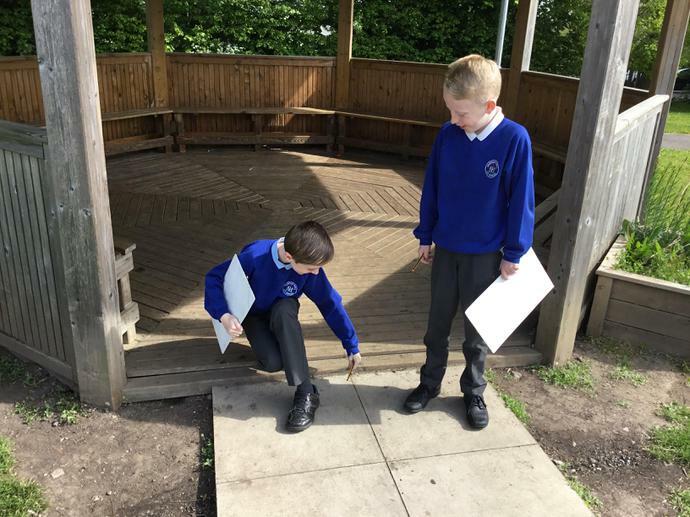 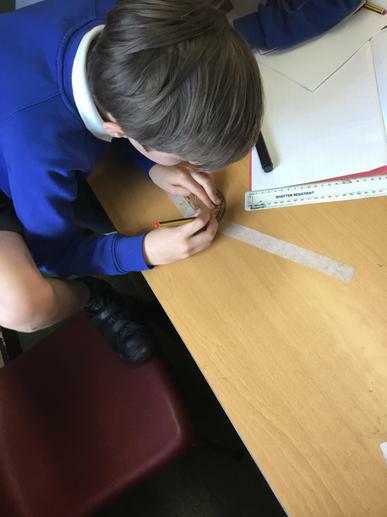 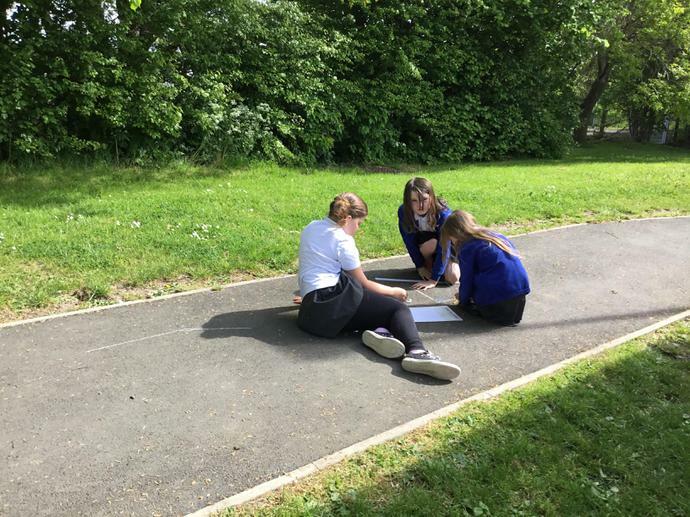 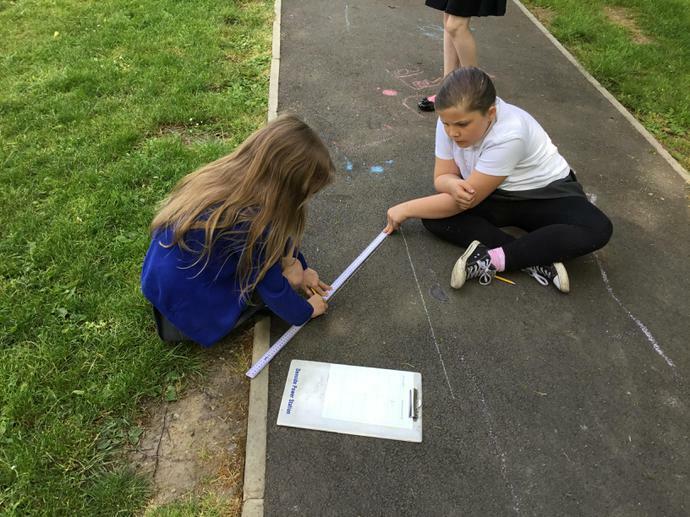 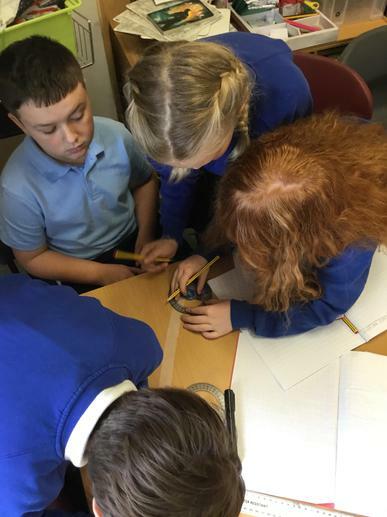 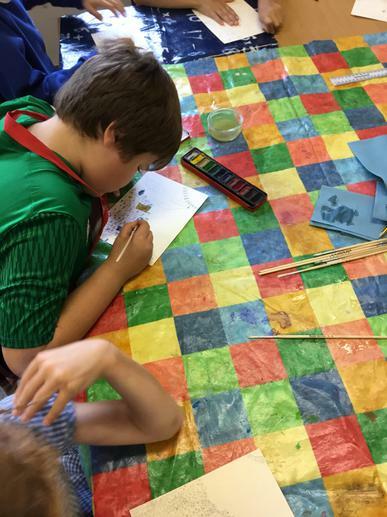 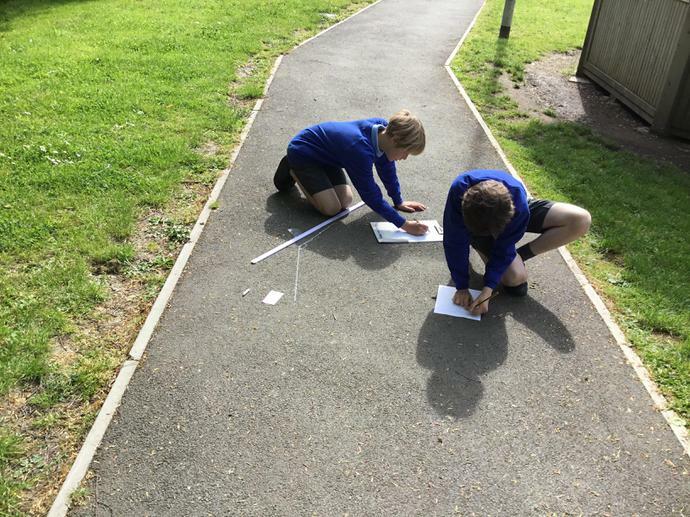 We began by measuring angles that Miss Bellis had created on the tables using masking tape and then progressed onto estimating and measuring angles in our school environment. 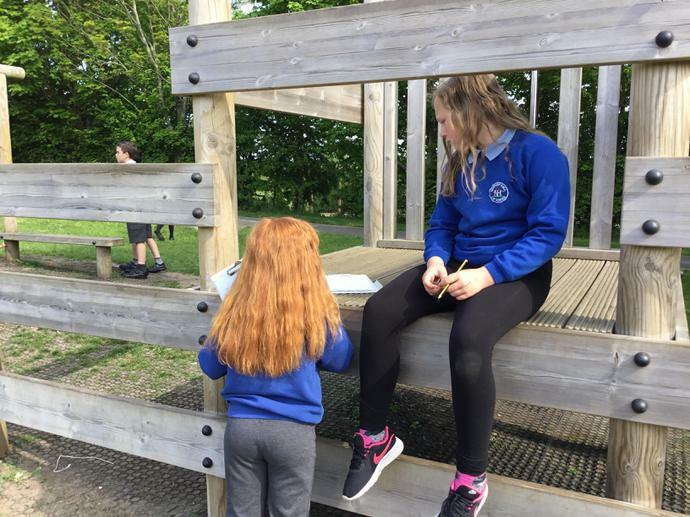 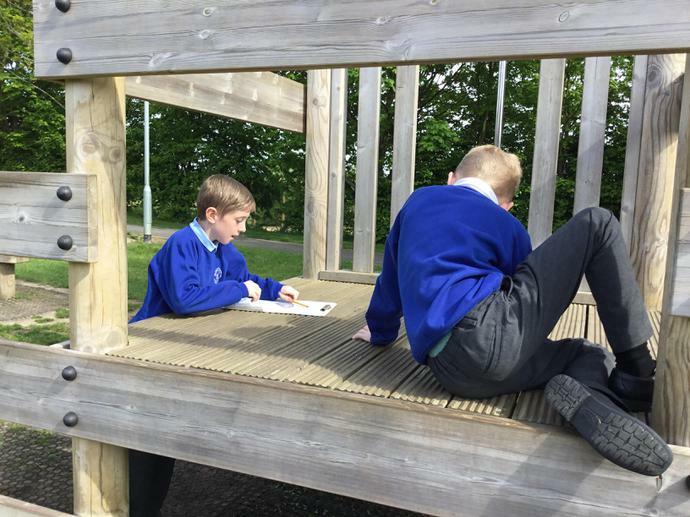 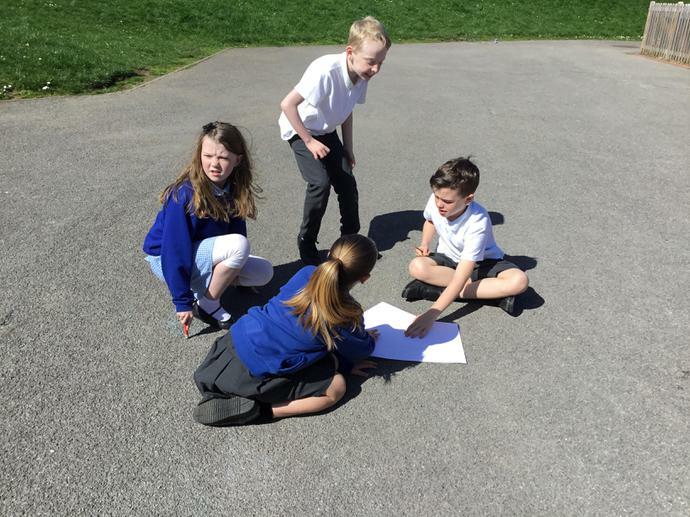 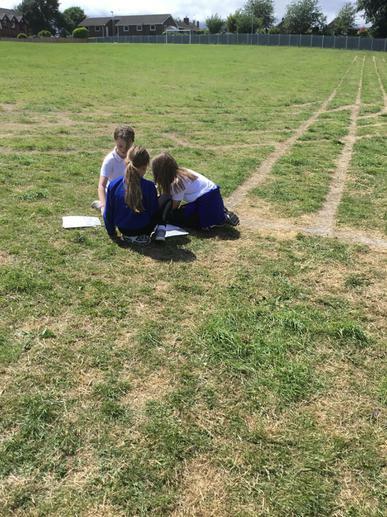 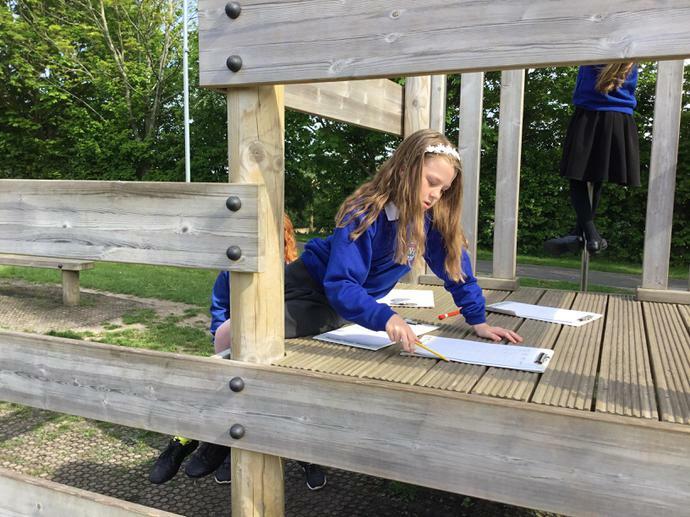 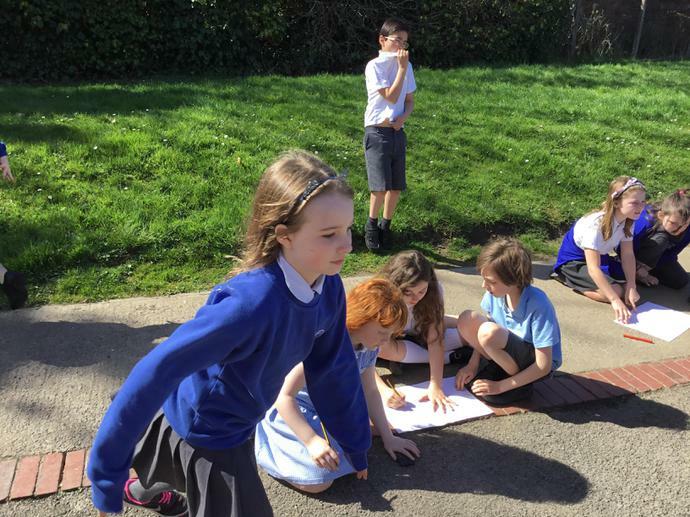 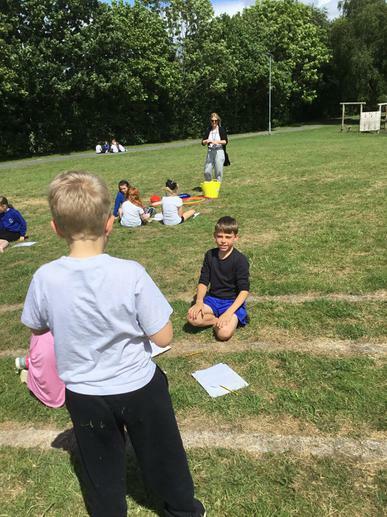 As the sun shone over Northop Hall, year 5 were outside working together to learn all of the key features of instruction texts. 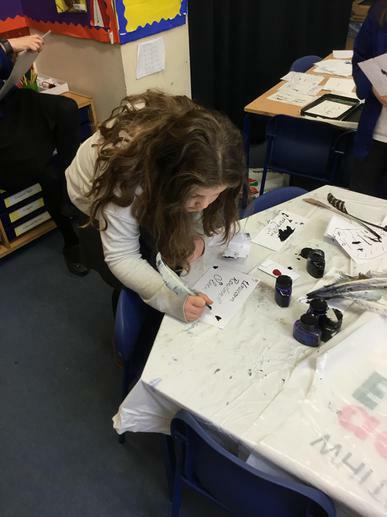 Well done to all of our artists and messengers, who had to remember and relay information back to their scribes! 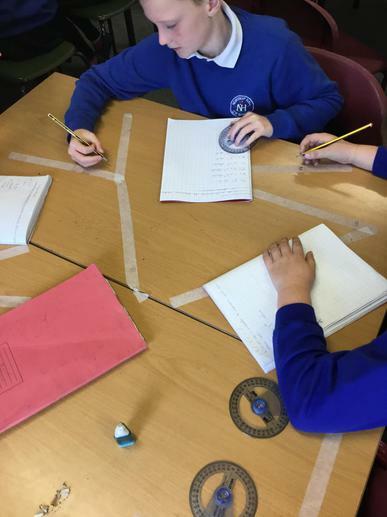 This week, as part of our Geography skills, we have been doing lots of map and compass work. 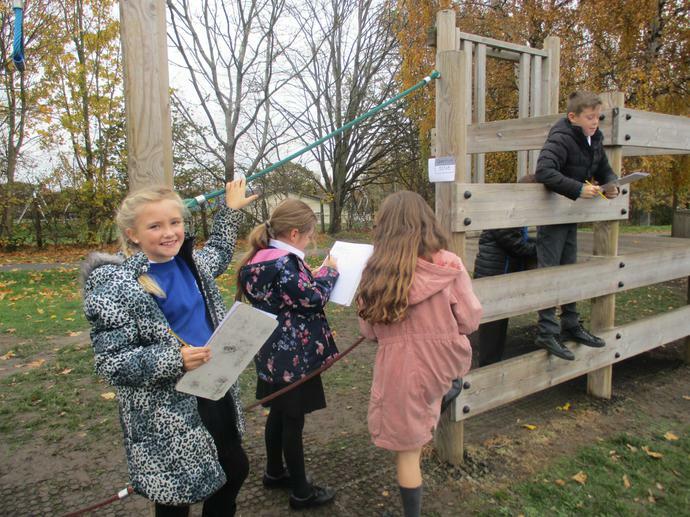 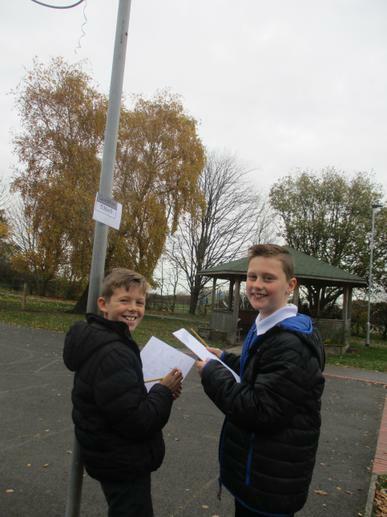 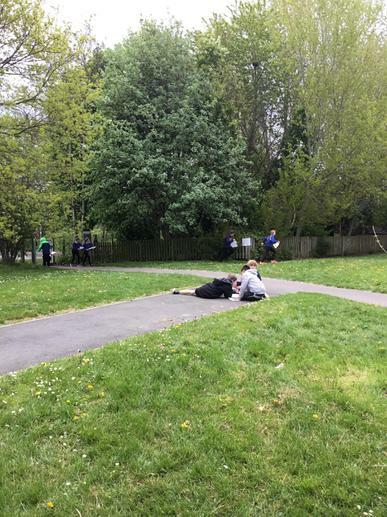 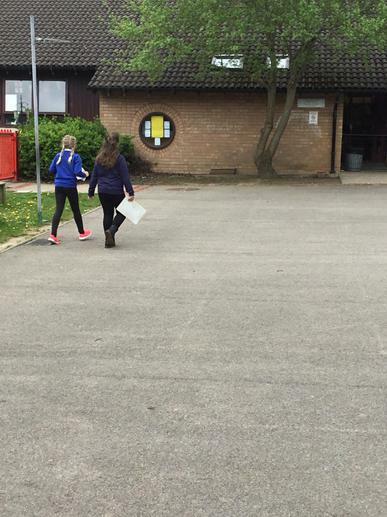 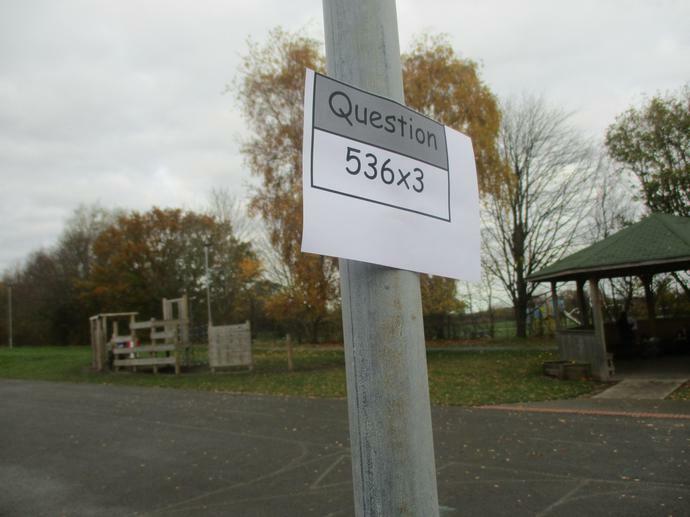 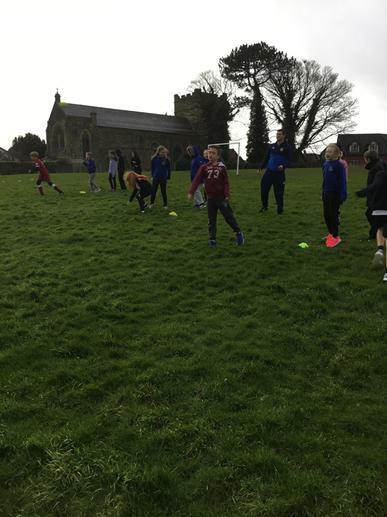 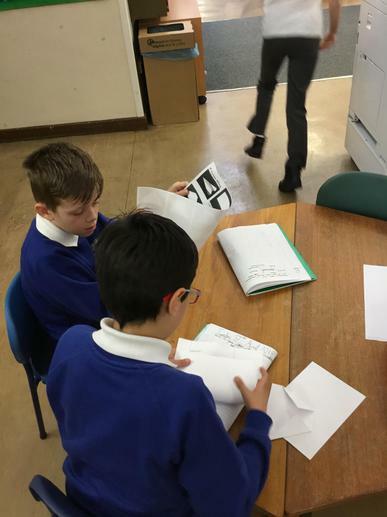 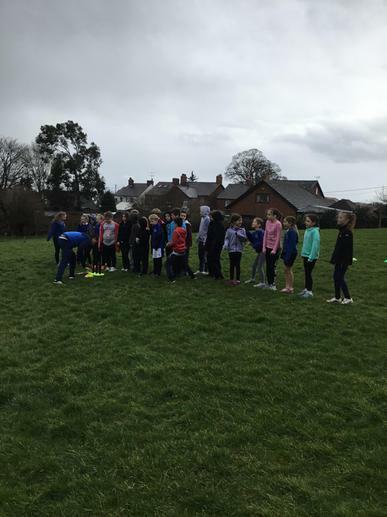 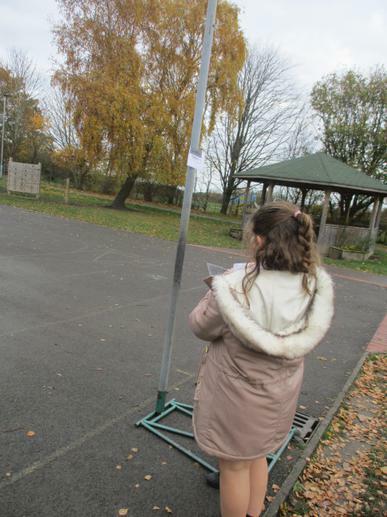 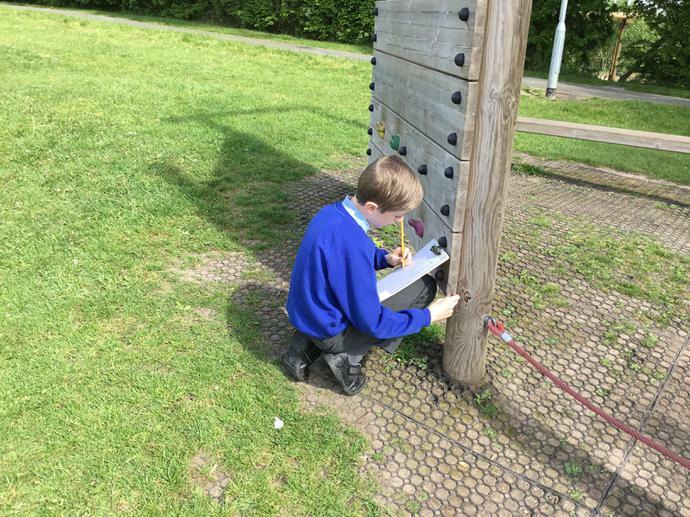 We dug out our Northop Hall School orienteering maps and in our teams competed to complete the course in the quickest time and unscrambled the word! 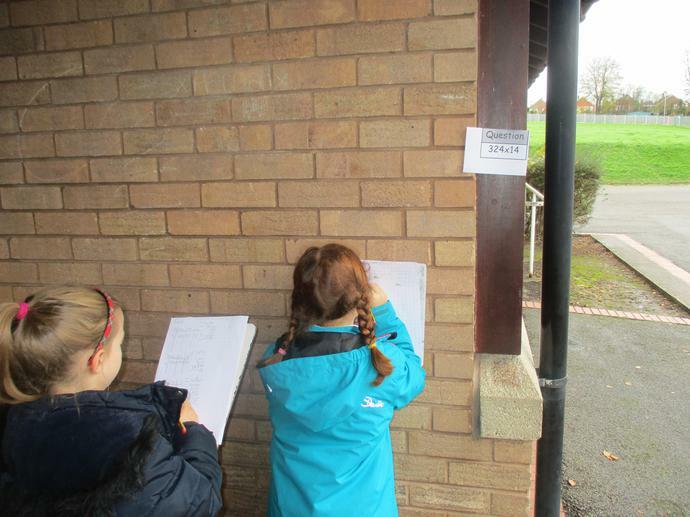 Well done to all of you for participating and using your spelling skills to unscramble 'Australia' to finish. 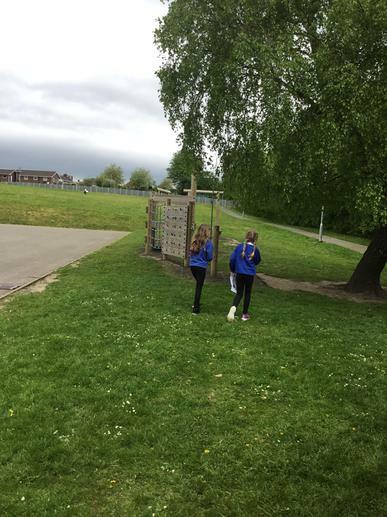 Our next step is to plan and create our own orienteering maps in groups to pass on to Year 4, who will give us feedback on our courses. 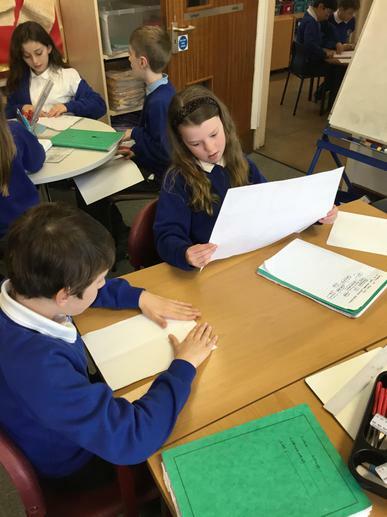 To begin the summer term we are focussing on instruction writing. 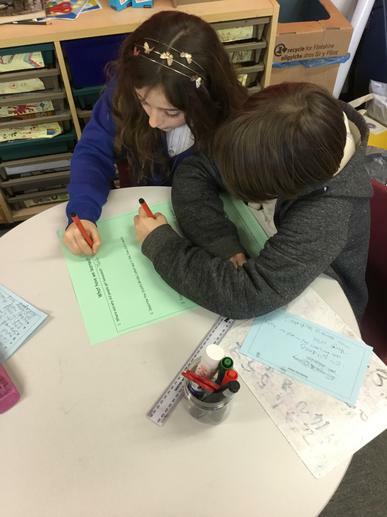 Today we began by evaluating each other's ability to give instructions verbally. 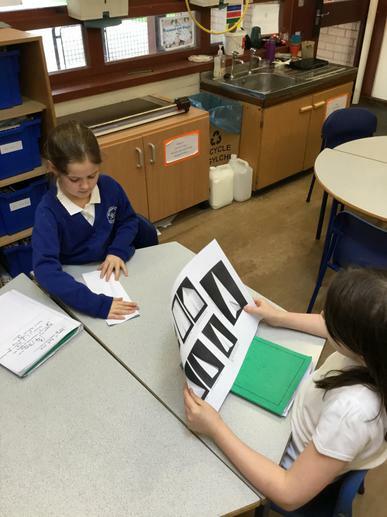 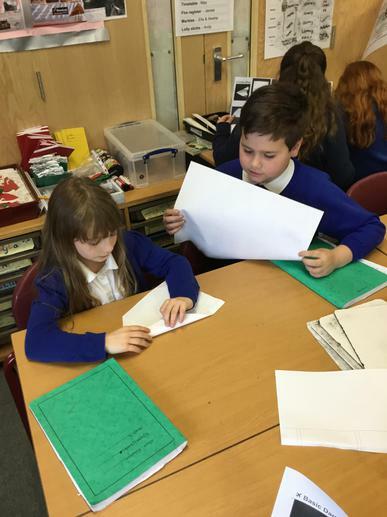 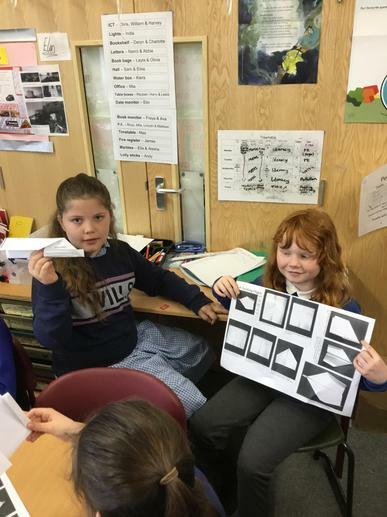 In pairs the children had to read out and describe instructions for how to make different types of paper aeroplane, without their partner seeing! 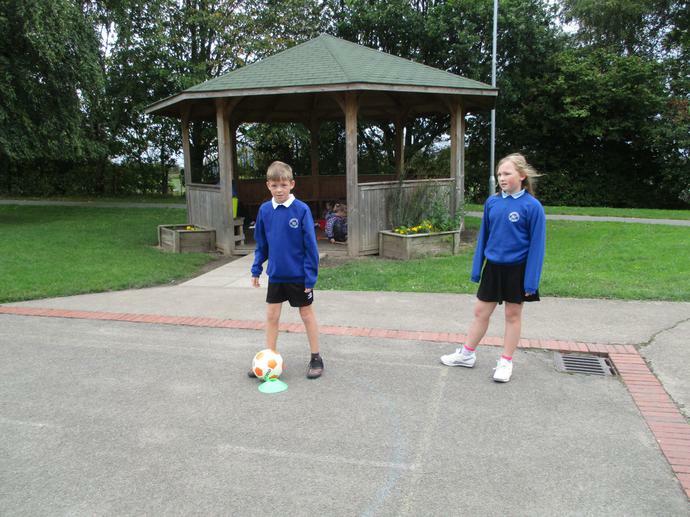 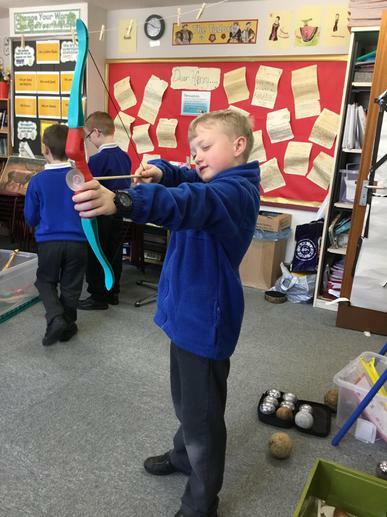 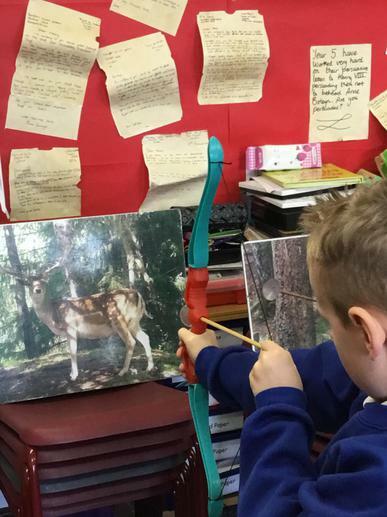 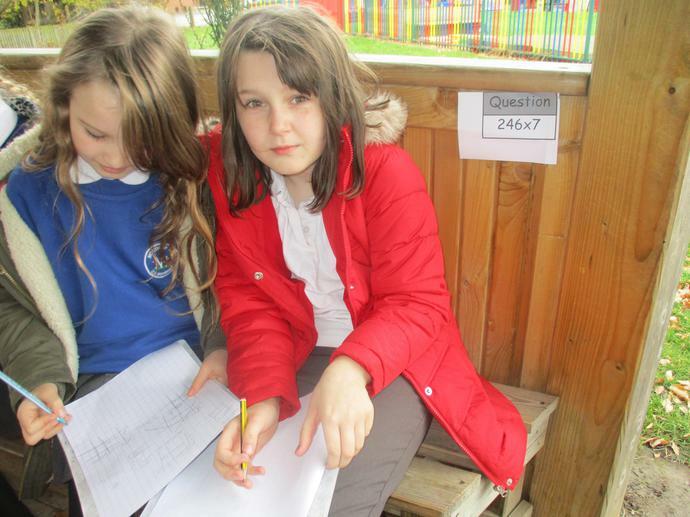 The children evaluated their partner's clarity and accuracy. 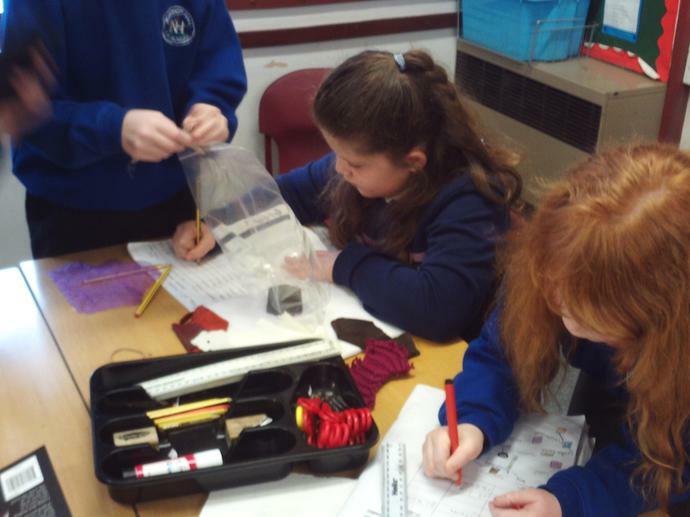 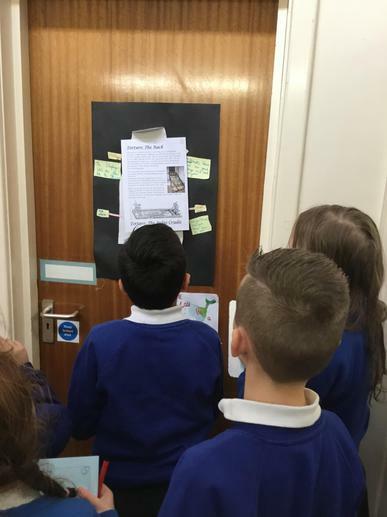 We have really enjoyed being super scientists this week to respond to the Royal Clothing Co. and their letter asking us to investigate the best material for Henry VIII's (look-a-like!) 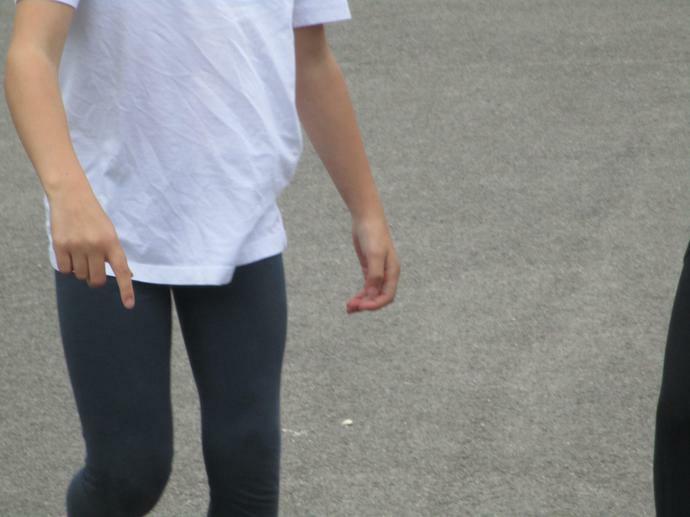 new tunic. 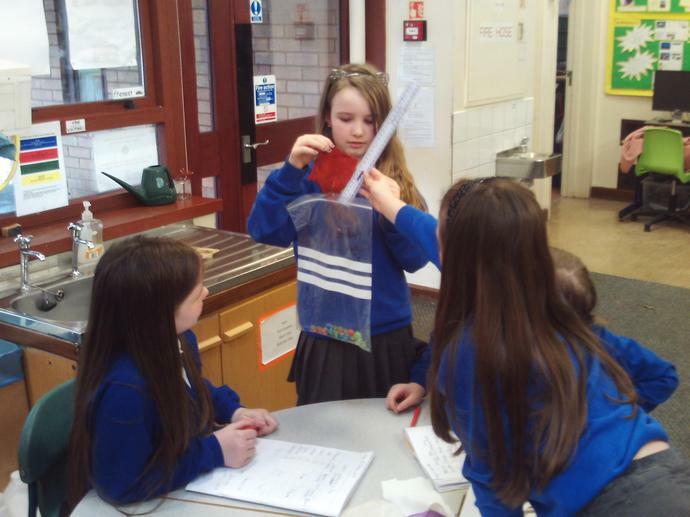 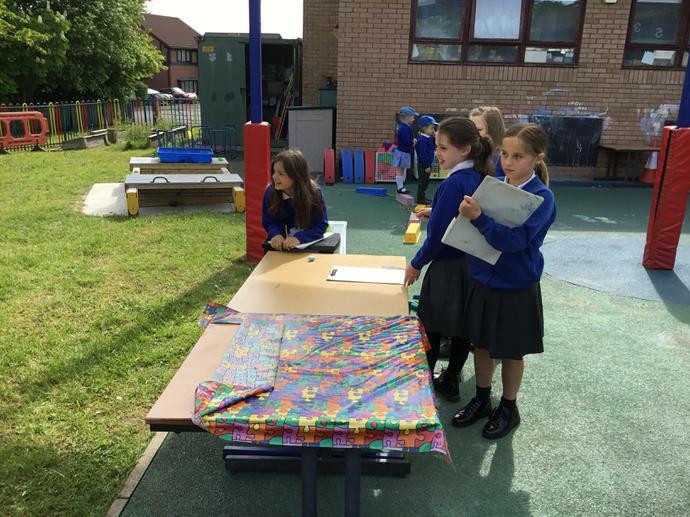 The children have planned their investigations and measured the stretch in 6 different types of material. 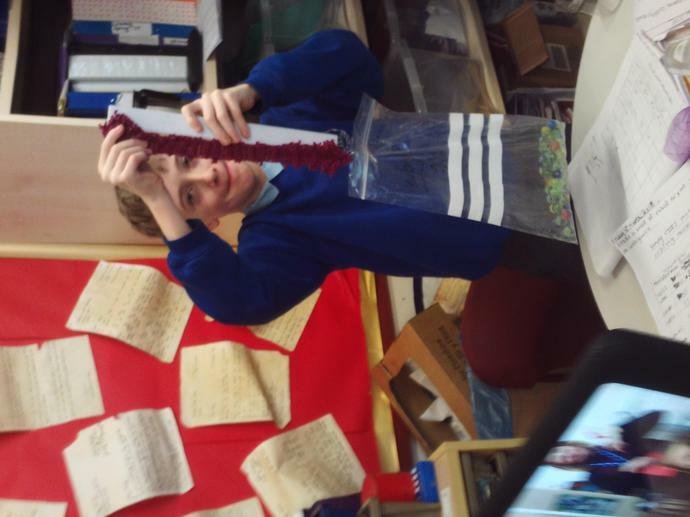 We have come to the conclusion that Lycra would be the best material to stretch over Henry's tummy! 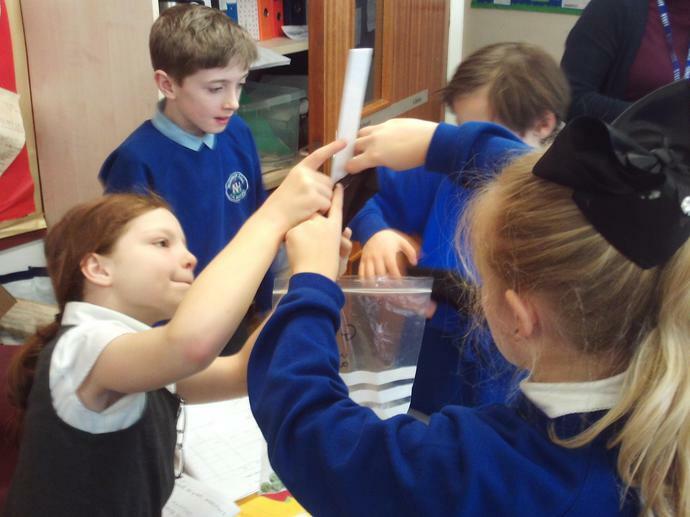 Well done scientists! 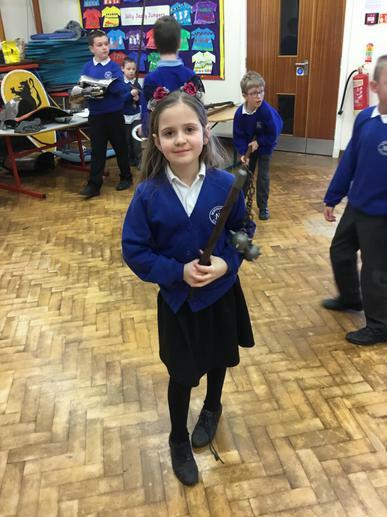 We had such a fantastic day along with the rest of KS2 exploring all of the fascinating artefacts that Mr Cope brought in for us! 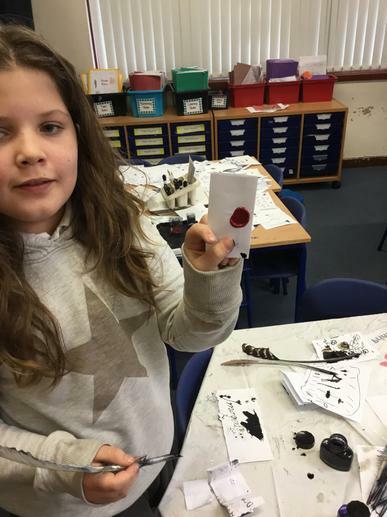 Year 5 participated in so many different Tudor activities throughout the day from Tudor dressing up and investigating Tudor weaponry to stamping their own names into leather! 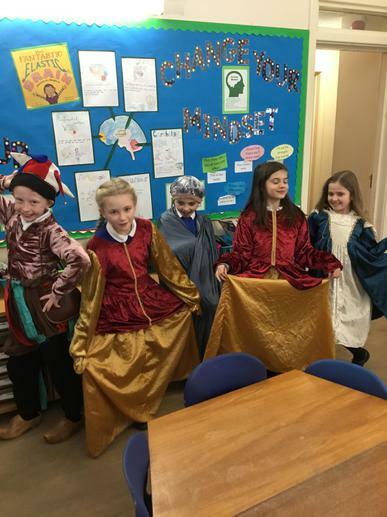 We ended the day with some horrible history style Tudor stories told by Mr Cope, we especially enjoyed hearing about the Tudor toilets!! 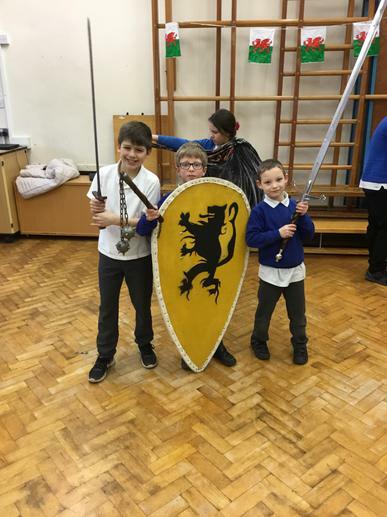 Well done to all of you for working so well in your groups and for taking extra special care to look after the historical items, we hope to see Mr Cope for future visits. 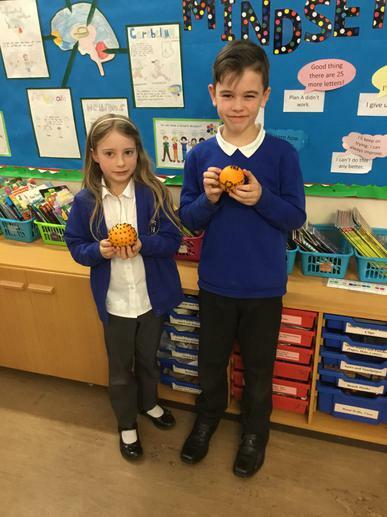 In school this week it has been all about being aware of our health and well-being. 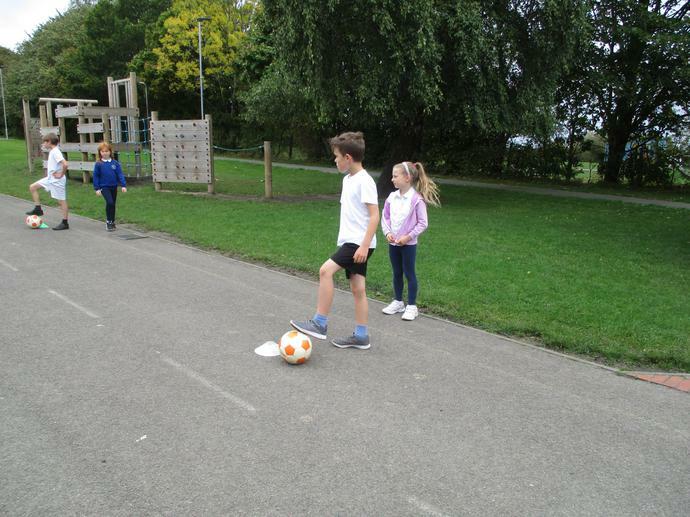 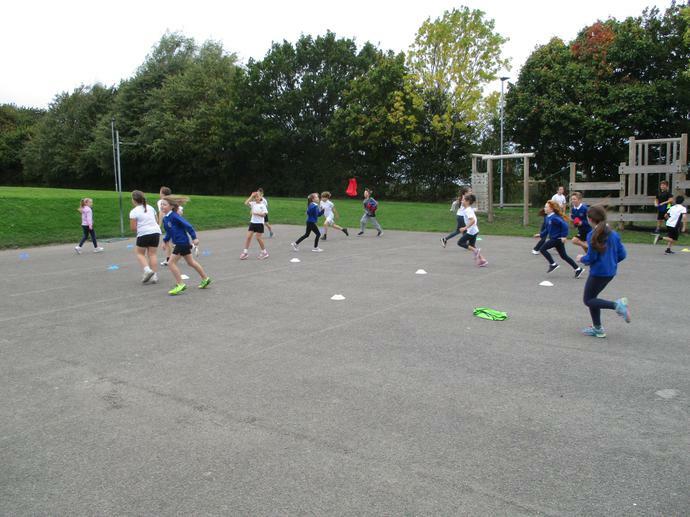 All classes have participated in a variety of healthy activities to promote looking after ourselves. 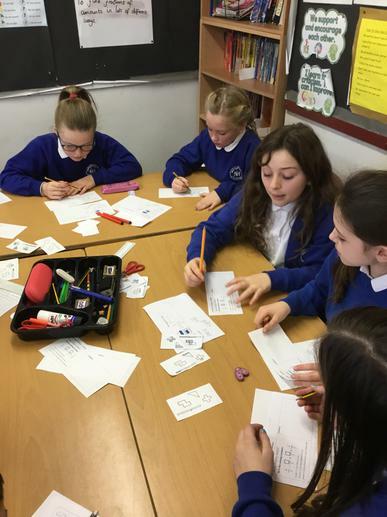 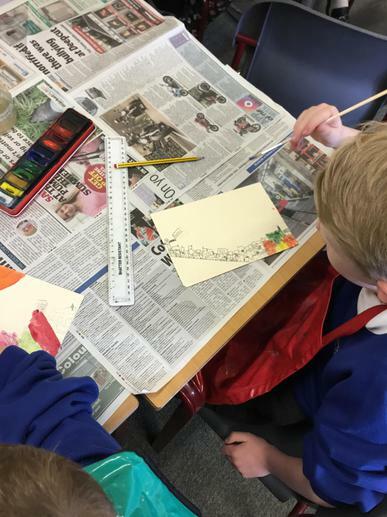 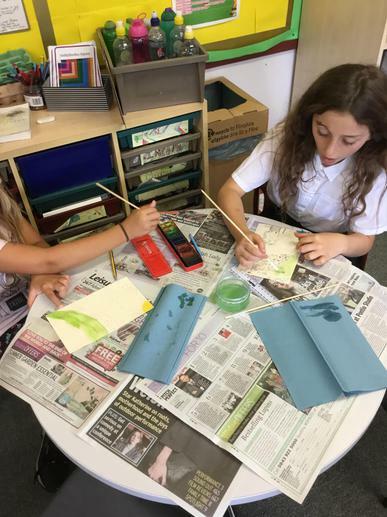 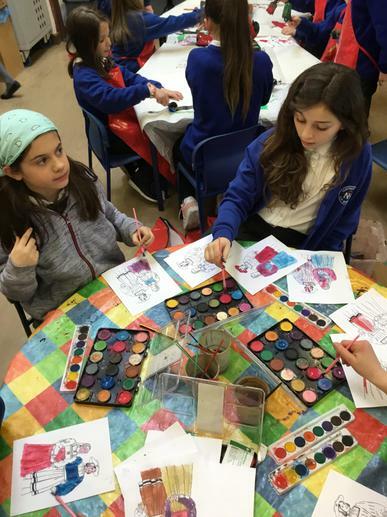 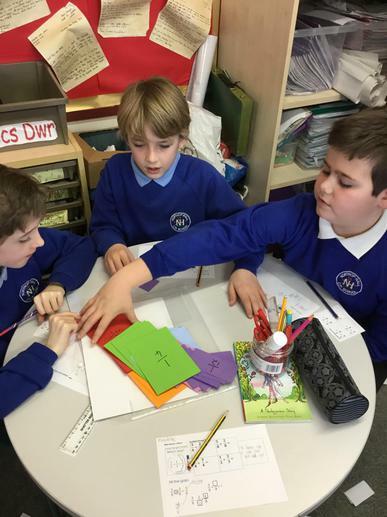 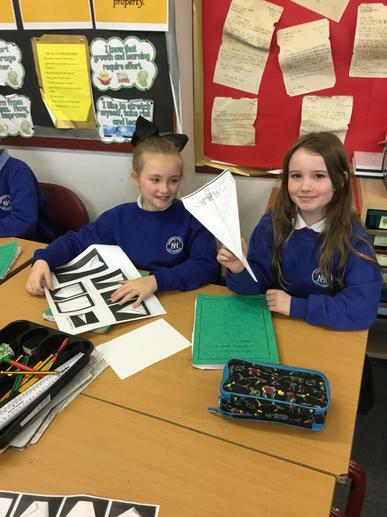 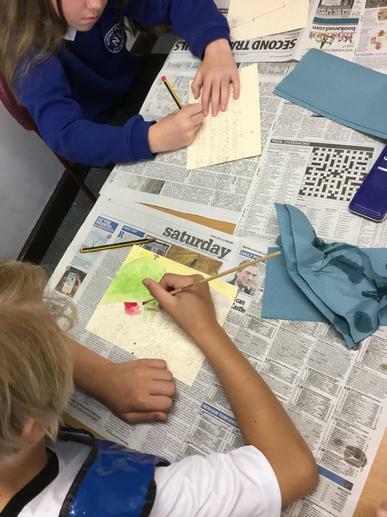 In year 5 we have made fruit kebabs, participated in a yoga session and researched a specific aspect of health, well-being or mindfulness and created a mini 'zine all about our area of interest. 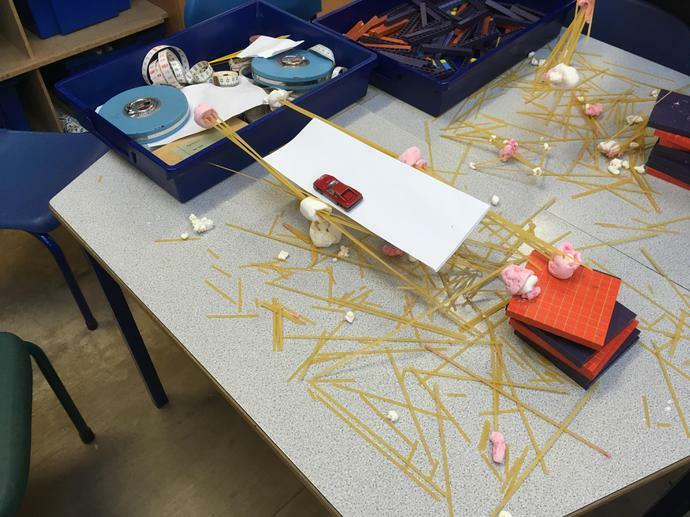 Good work everyone! 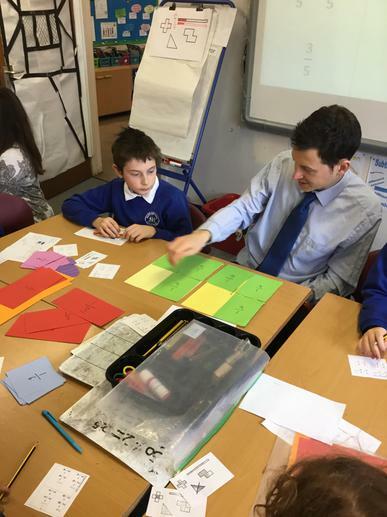 This morning we have been very lucky to have a maths lesson taught by Mr Gareth Metcalfe. 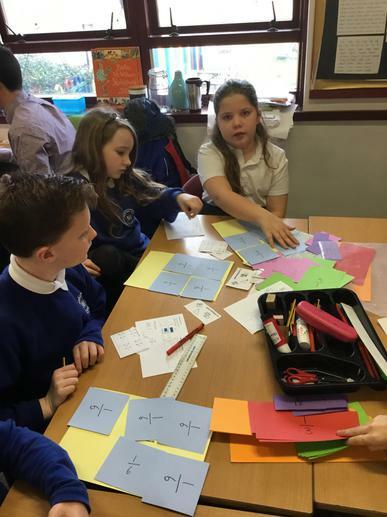 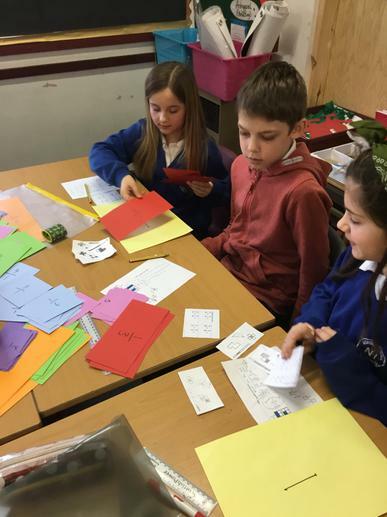 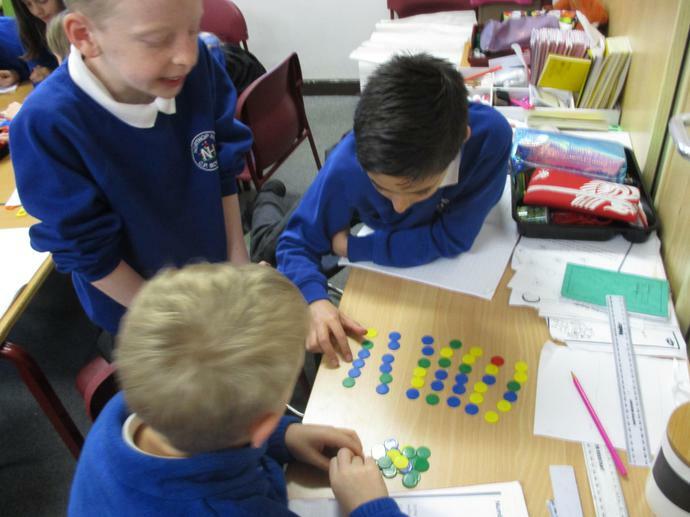 The children developed their fractions skills using visual methods this supported them when adding fractions with common denominators. 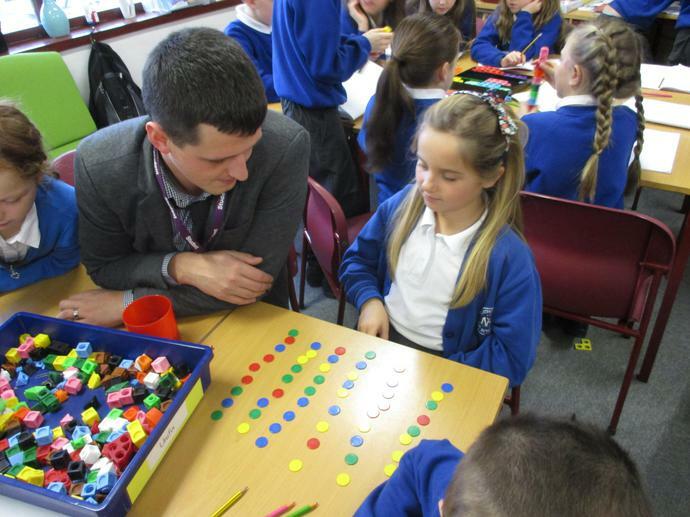 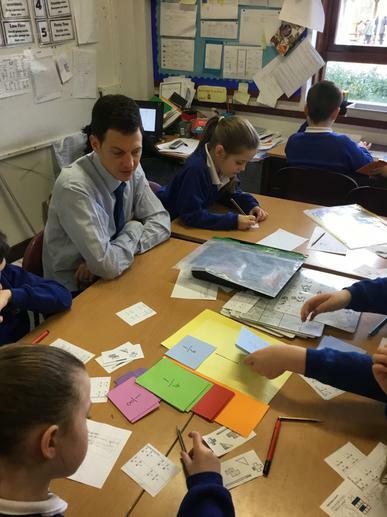 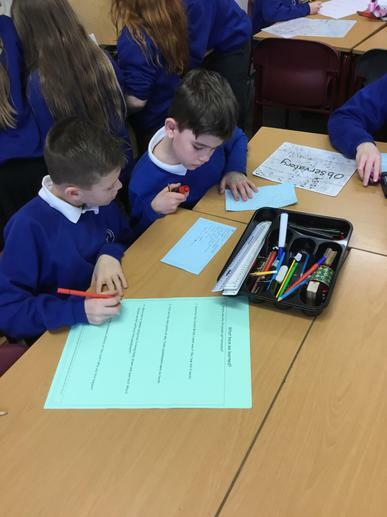 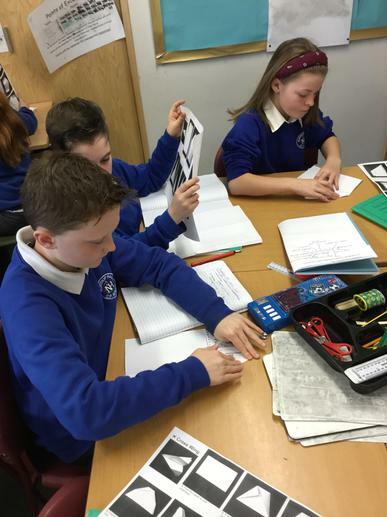 We look forward to continuing to work with Mr Metcalfe and sharing his teaching methods, to help to continue to grow our knowledge of number. 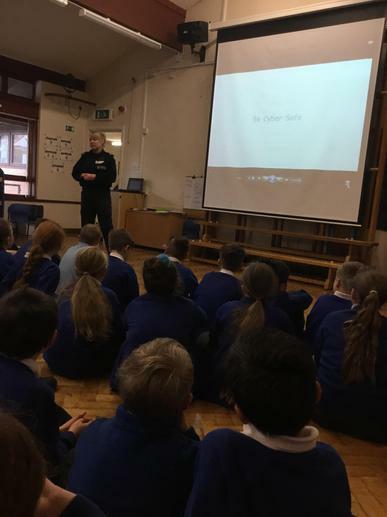 PC Ashton visited year 5 and 6 today to make us aware of keeping safe online, especially with social media and online gaming. 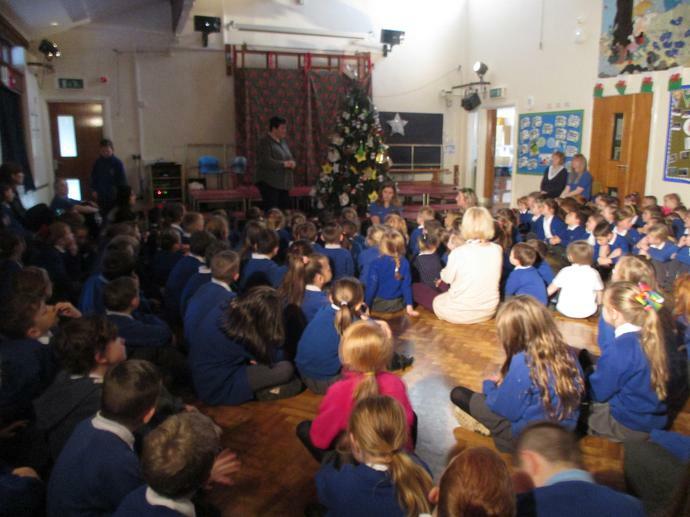 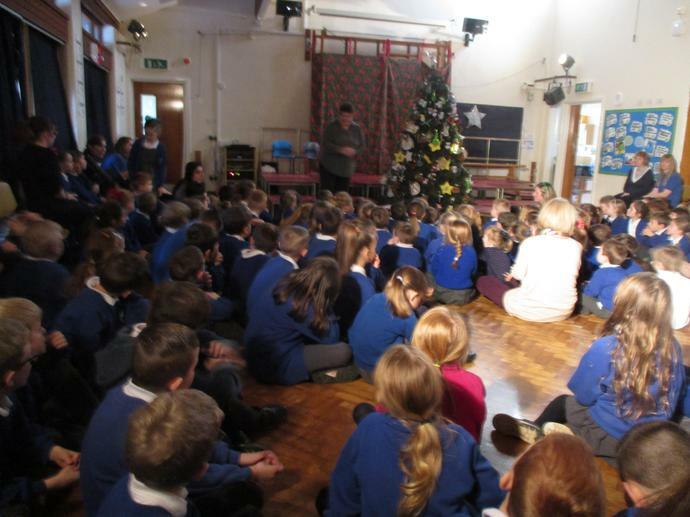 She discussed the rise of cyber bullying and shared what children can do if it happens to them. 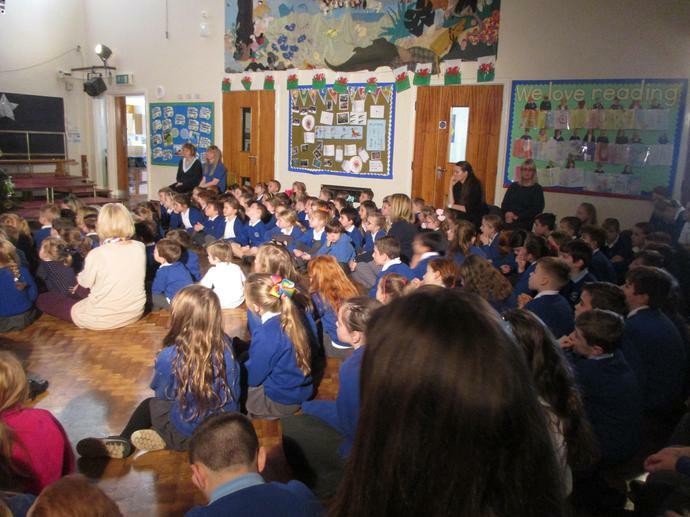 This has formed part of our online safety education this week. 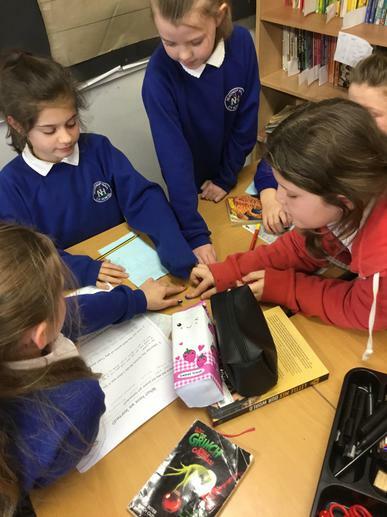 Year 5 have discussed how safe they are online and have shown that they are aware of the potential dangers online. 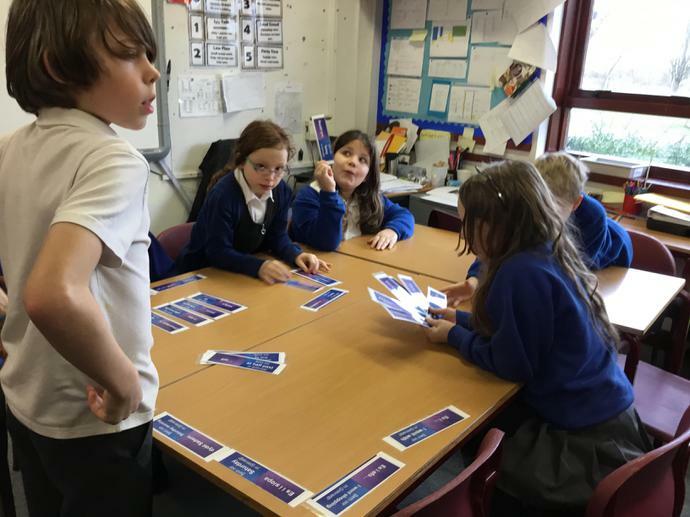 Our latest past tense loop cards, to support our Welsh speaking and writing, are going down a storm! 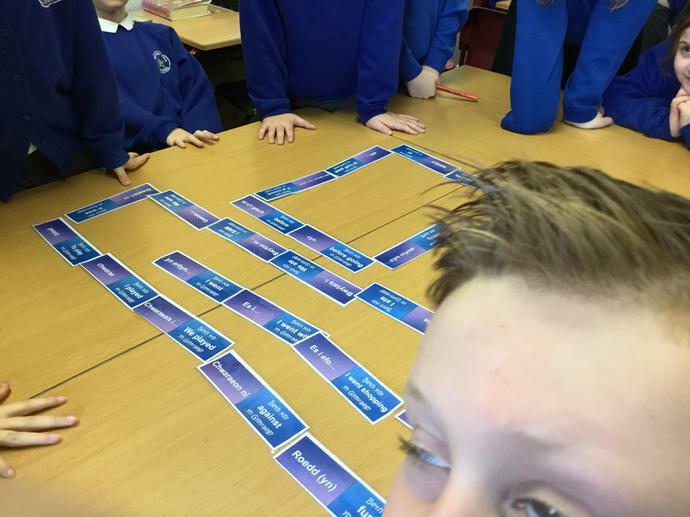 Groups are competing to complete the loop of questions and answers in the fastest time. 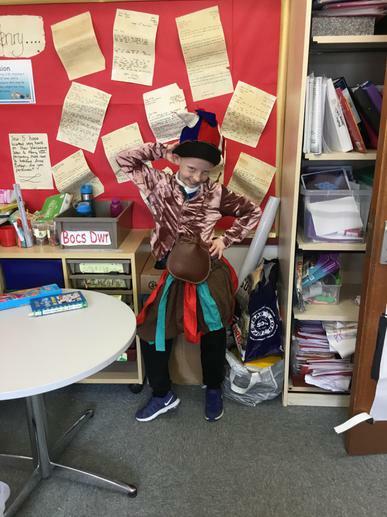 Year 5 interview Anne Boleyn! 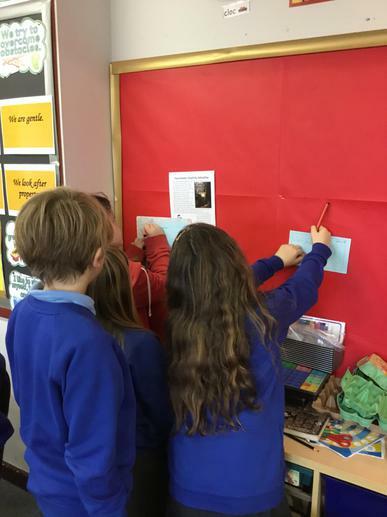 On Tuesday, year 5 worked on open questioning and wrote questions to ask our very own Anne Boleyn's! 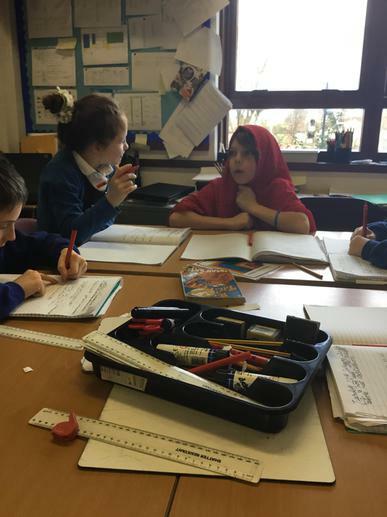 They got a lot out of this hot seating activity, it forced the children to think in role and adjust their speech for a different purpose, a key oracy skill. 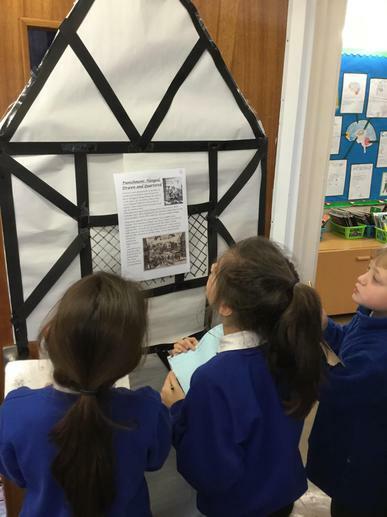 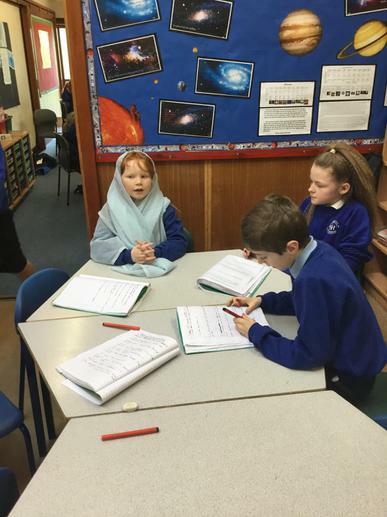 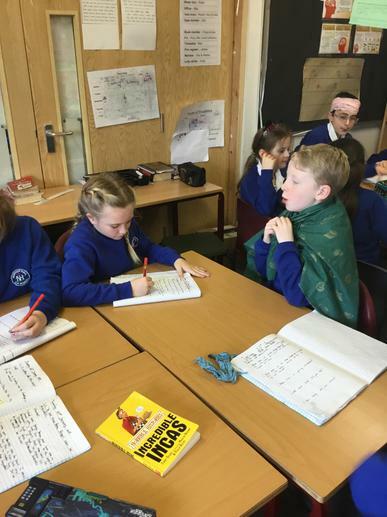 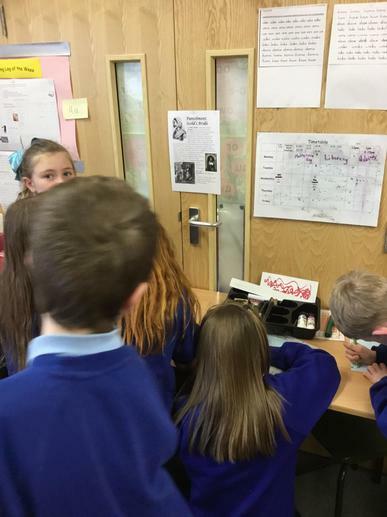 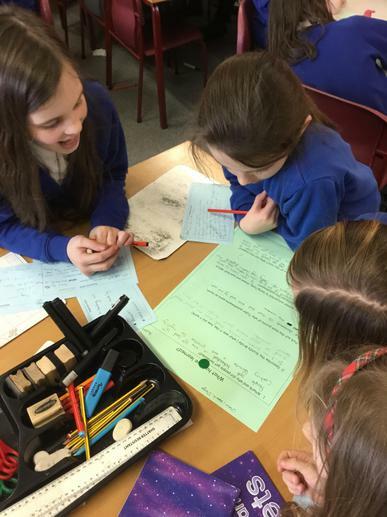 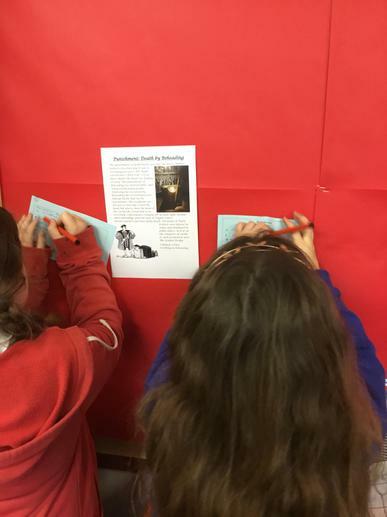 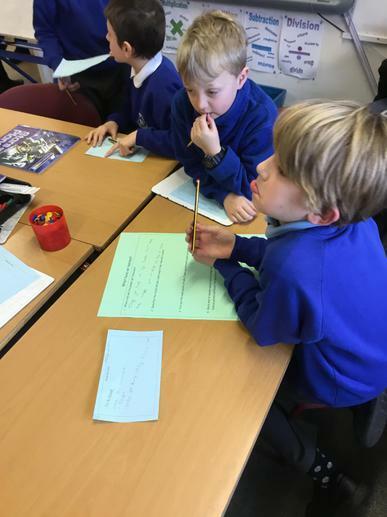 This week the children have been learning about Tudor crime and punishment, the children found their own information to relay back to their groups. 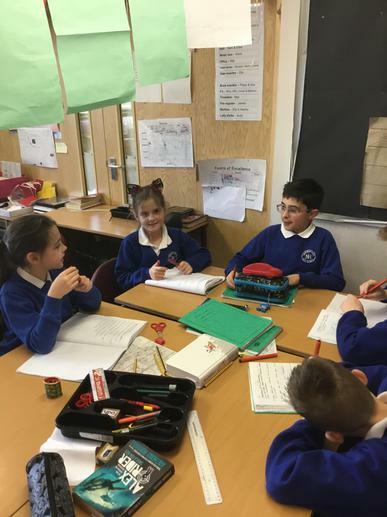 We then trialled our new 'talking chips' for our group discussion, the children expressed their views and opinions in a very mature manner indeed! 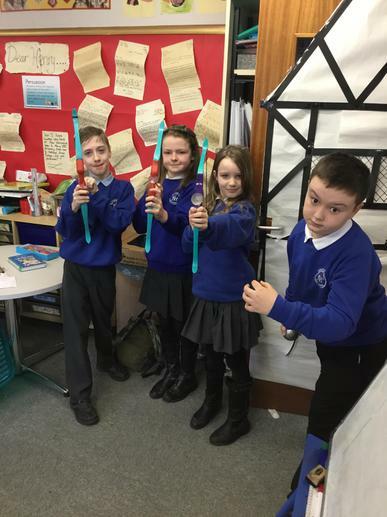 We are looking forward to writing a letter to Henry VIII to persuade him not to sentence Anne Boleyn to death! 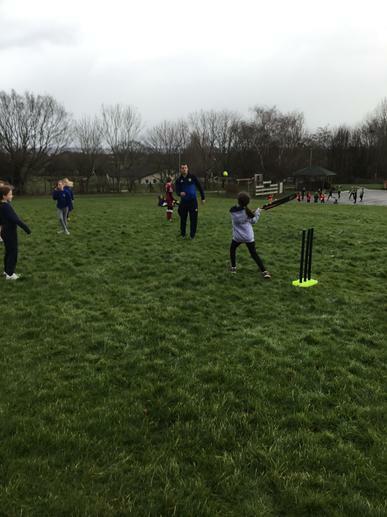 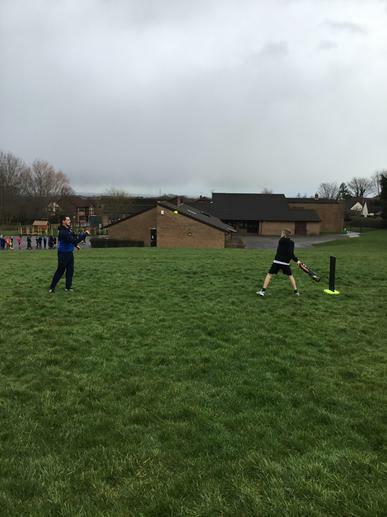 This term I will be working with the children in PE to develop their cricket skills! 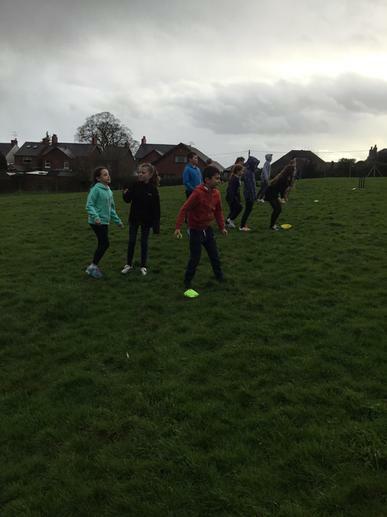 Today was our first session and the standard was extremely impressive. 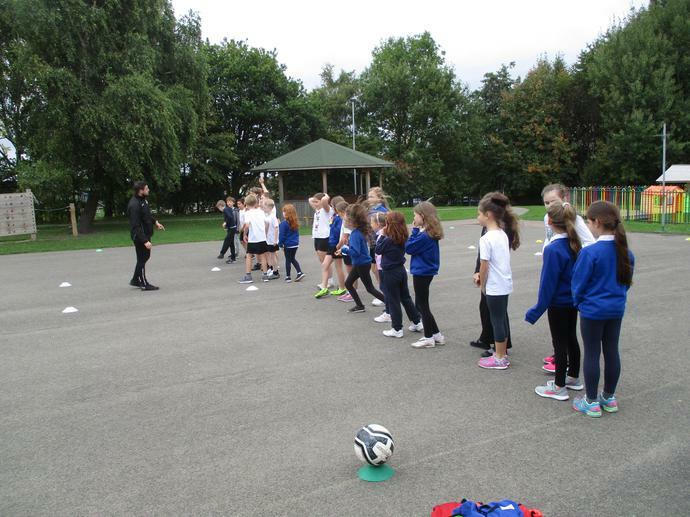 I am looking forward to seeing the children develop over the course of the term. 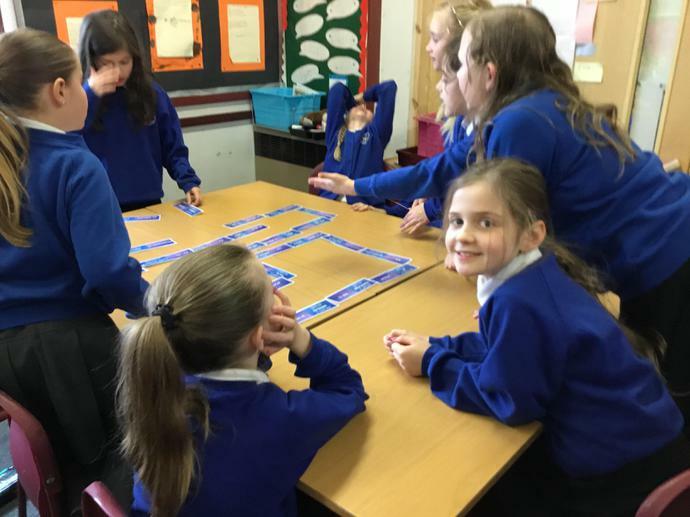 This week year 5 have been transferring their Pie Corbett story mapping skills to their Welsh lessons. 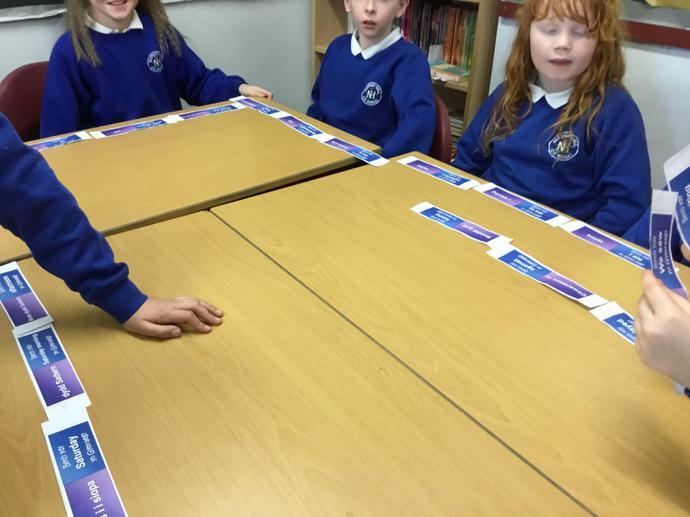 We are learning to talk about ourselves in detail by using our own story maps to help us to remember our paragraphs. 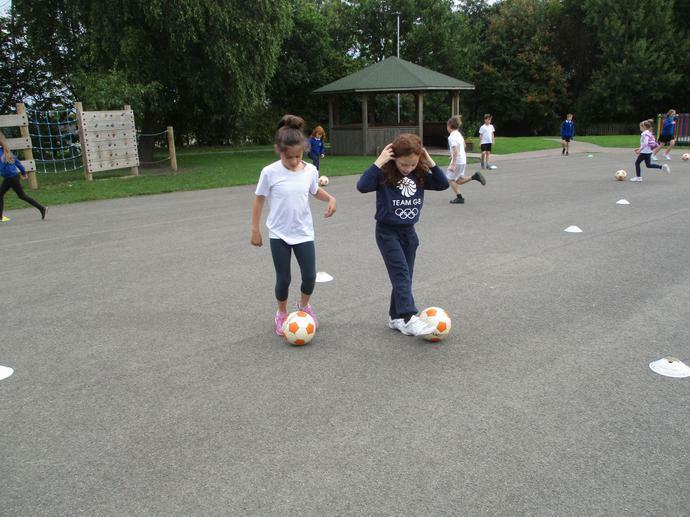 Here are a few children who have been practising! 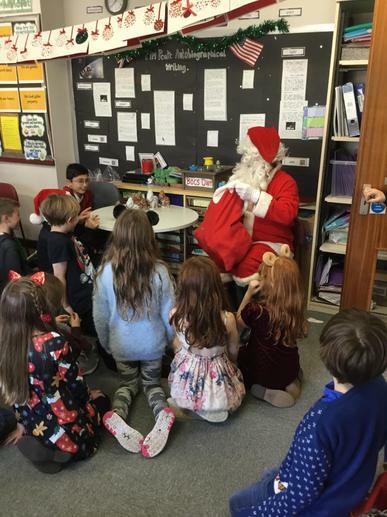 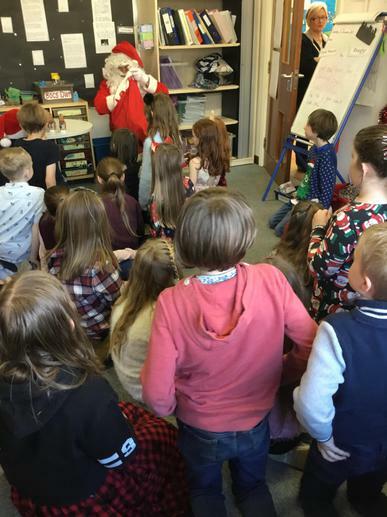 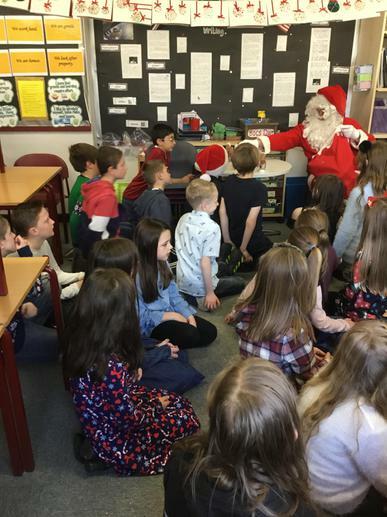 Father Christmas visits year 5! 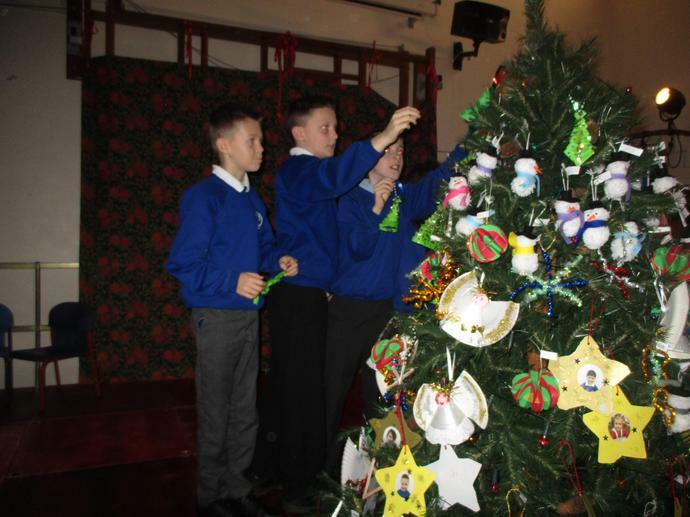 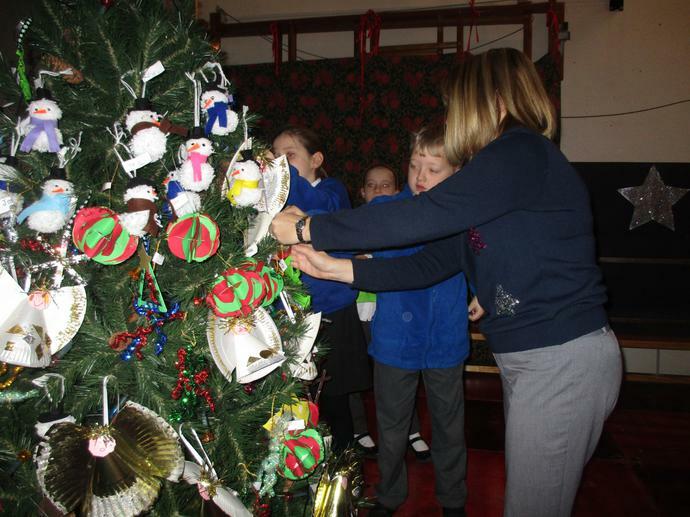 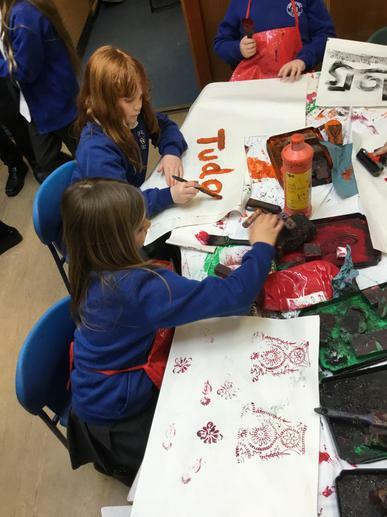 Year 5 made lovely paper Christmas trees this year with the help of our Chester University Associate Teacher Mr Jones. 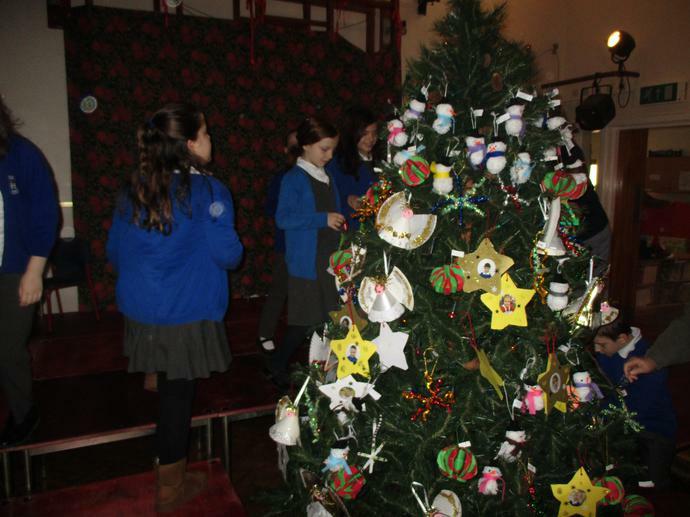 It was quite fiddly but the children enjoyed the creativity of it and they twinkle beautifully in the lights! 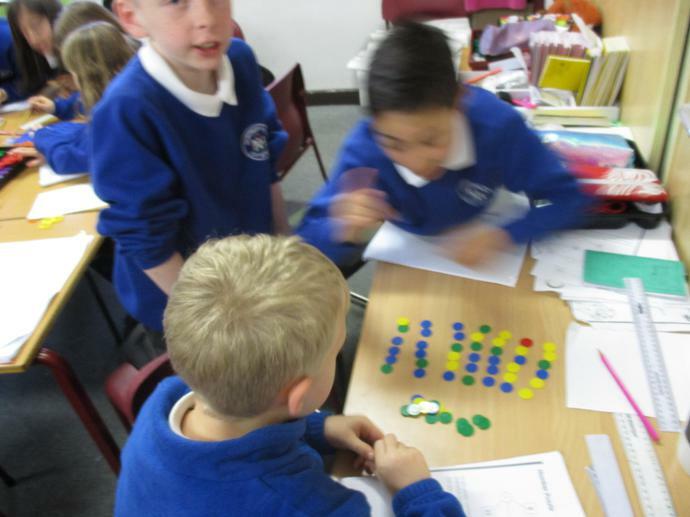 This week the children have been learning to divide using lots of different visual resources. 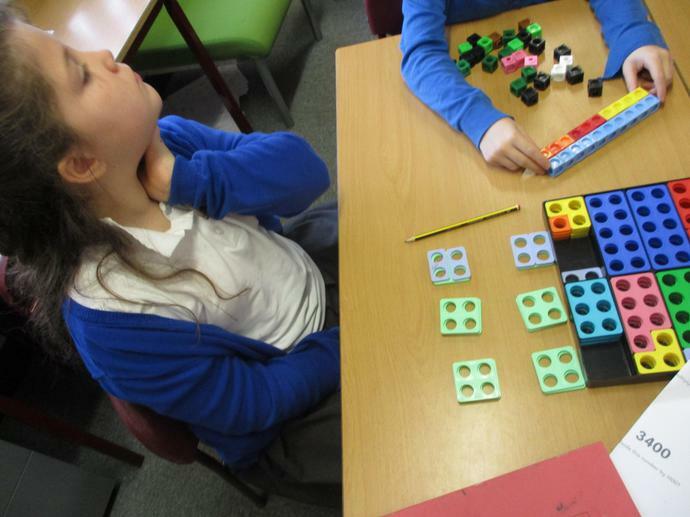 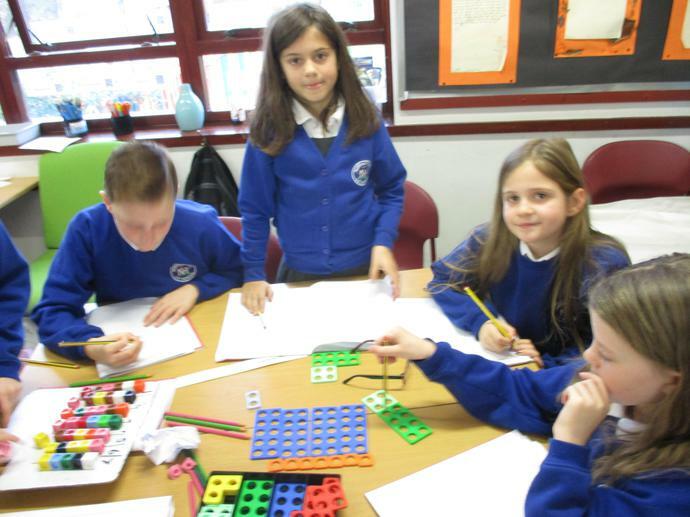 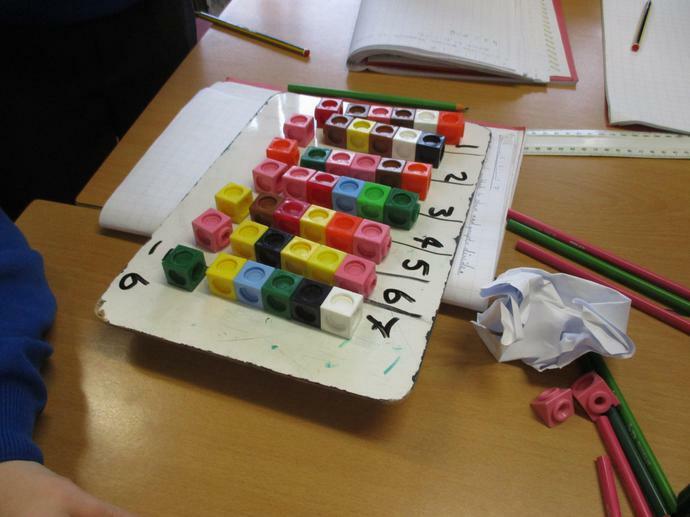 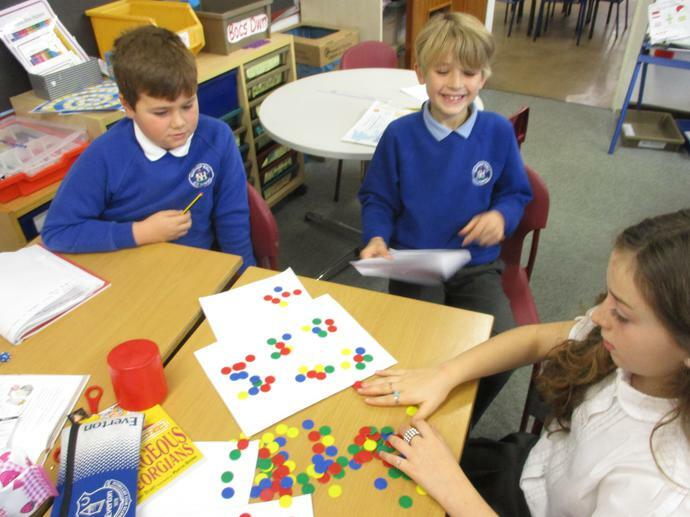 They have been using: Numicon, counters, bridging method, grouping and multi-link cubes. 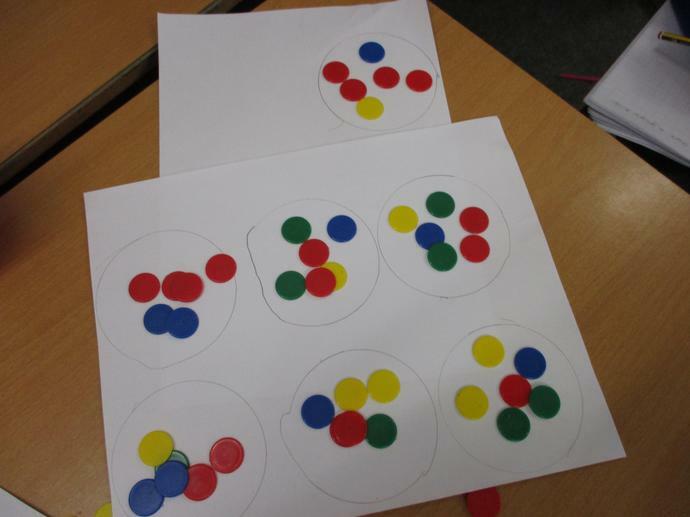 This has been helping the children to really grasp the concept of division, as the inverse of multiplication. 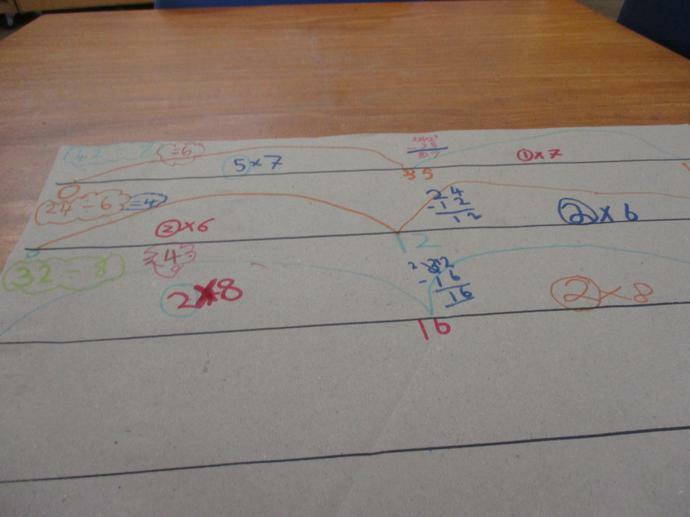 Now the children will link their visual methods to the short written method and bridging method. 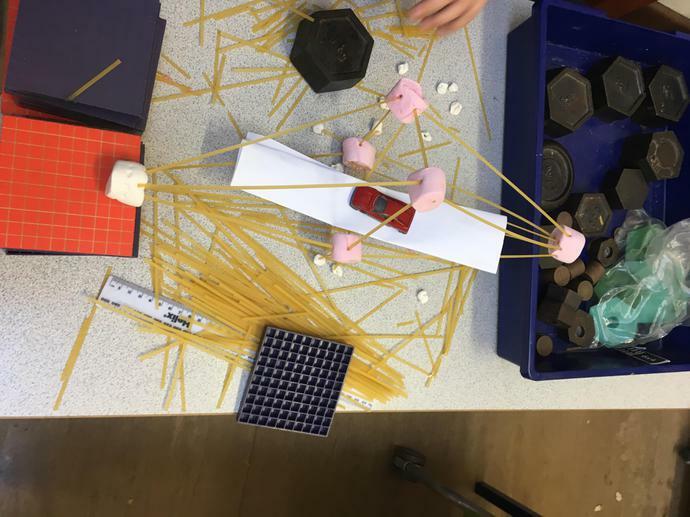 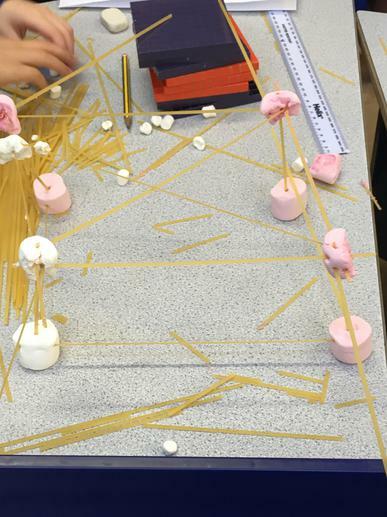 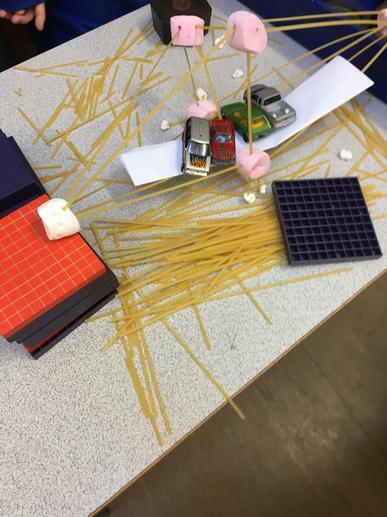 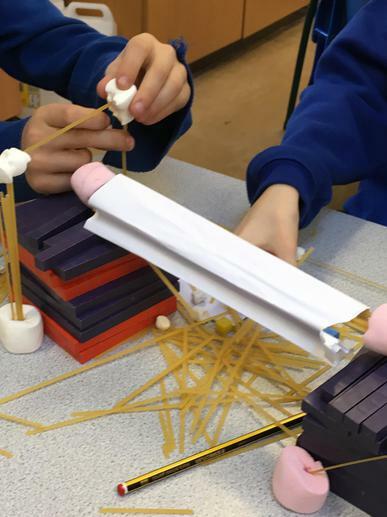 Year 5 have been working with parent and STEM Ambassador Ms Dale to design and build bridges. 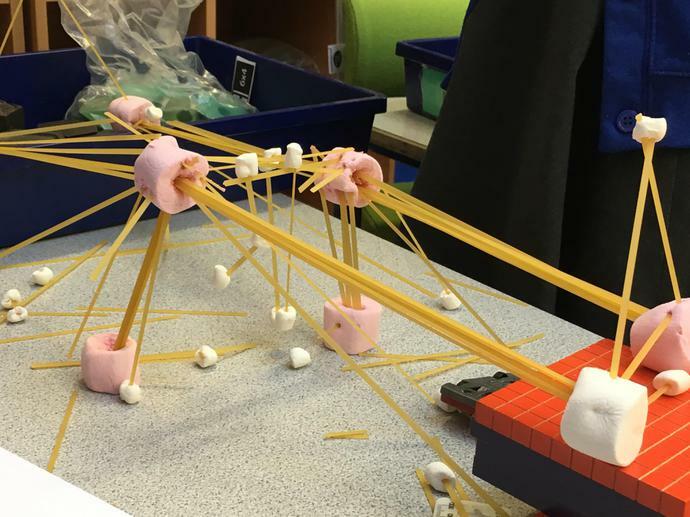 They have been learning what it takes to become an engineer, testing their bridges for strength and complexity of design. 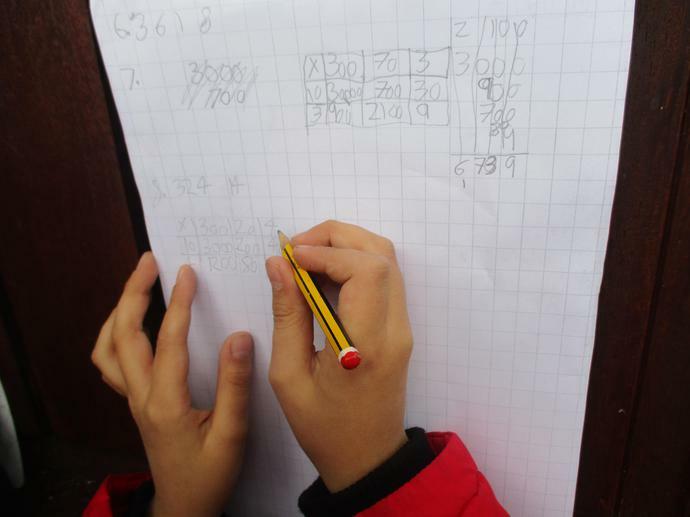 This week we are extending our times tables to solving long multiplication using the grid method. 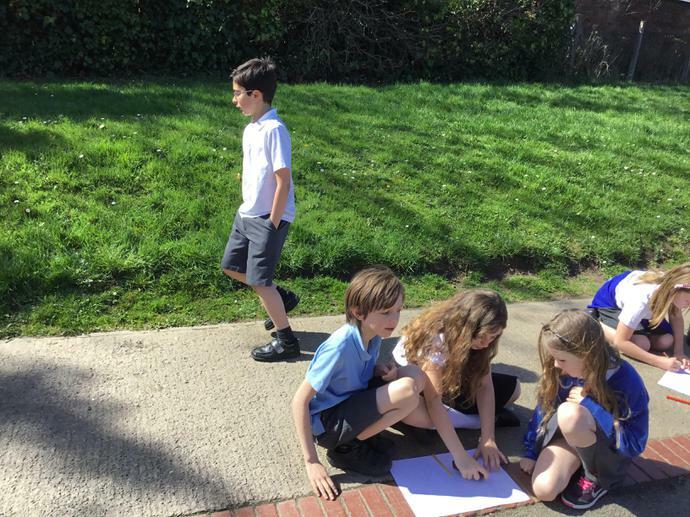 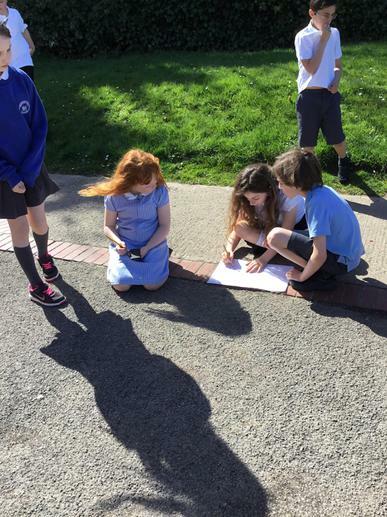 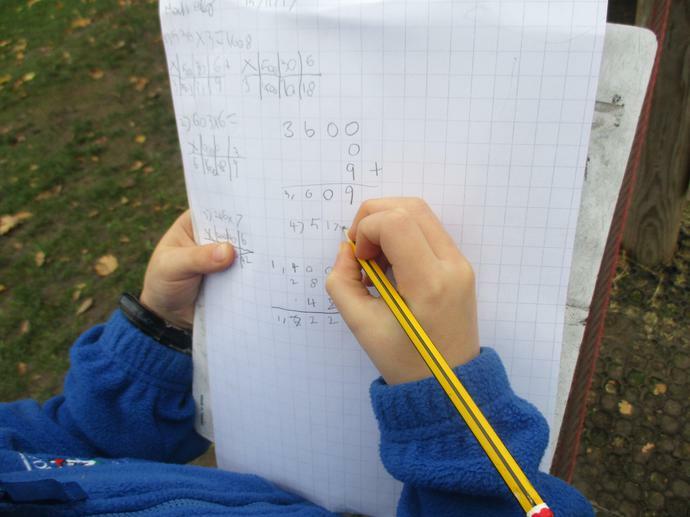 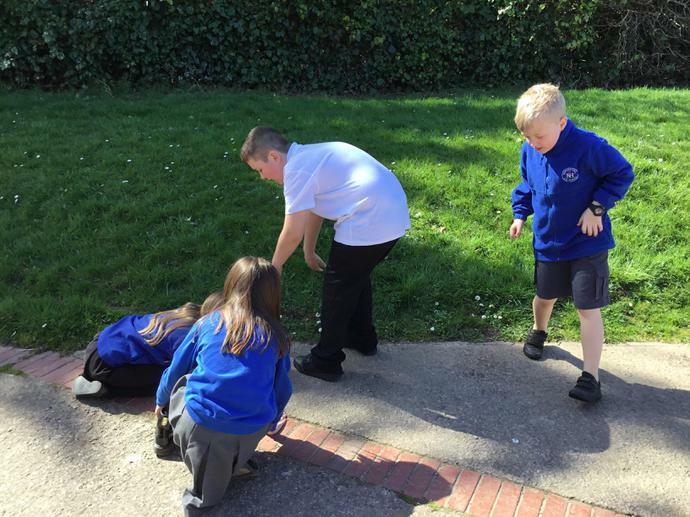 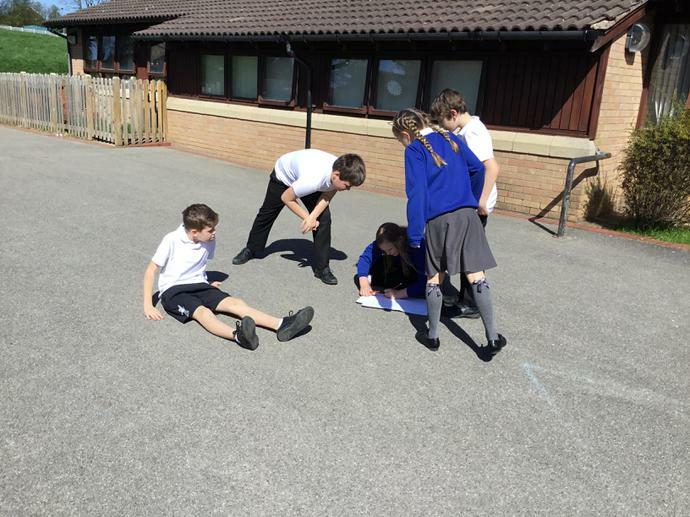 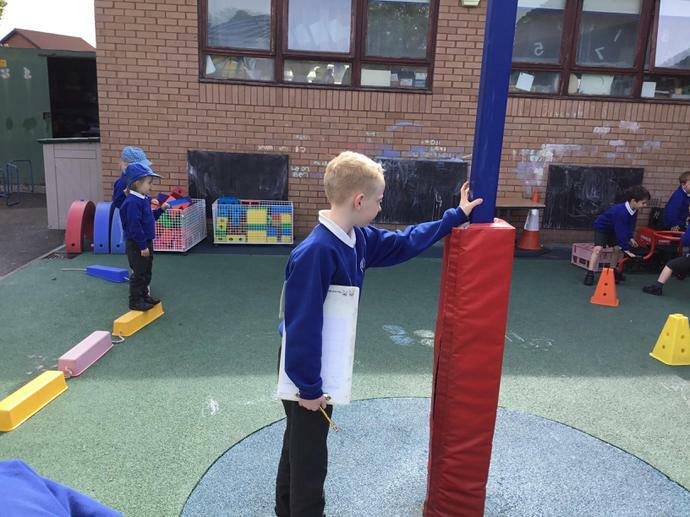 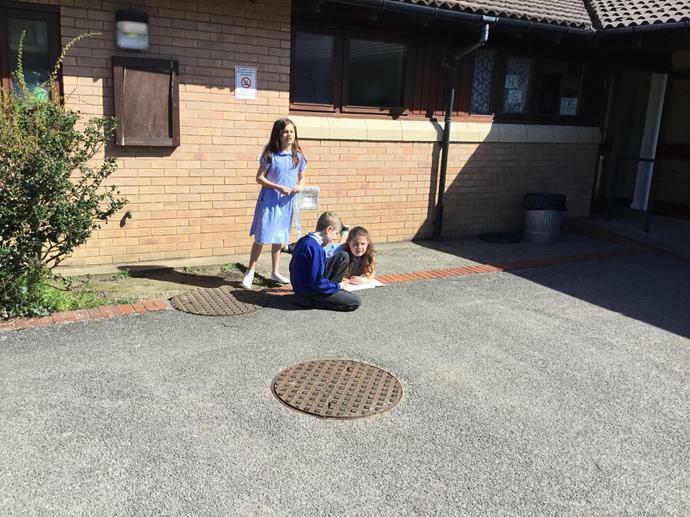 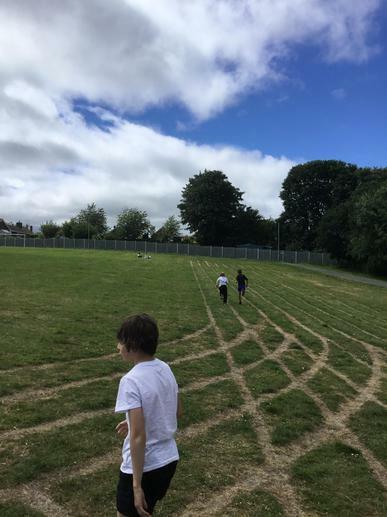 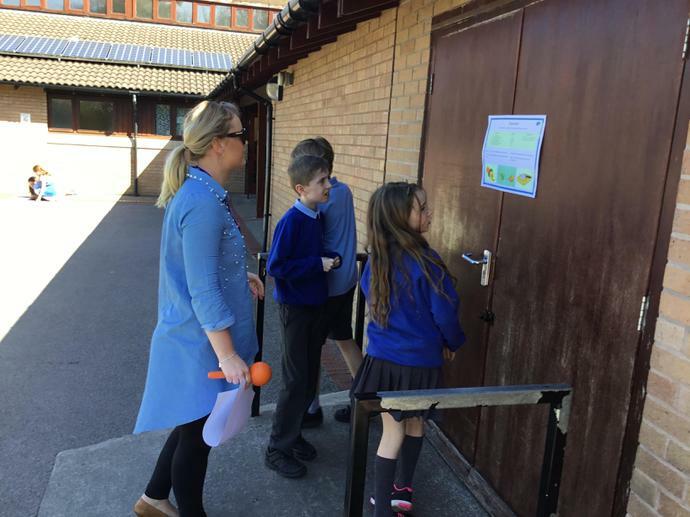 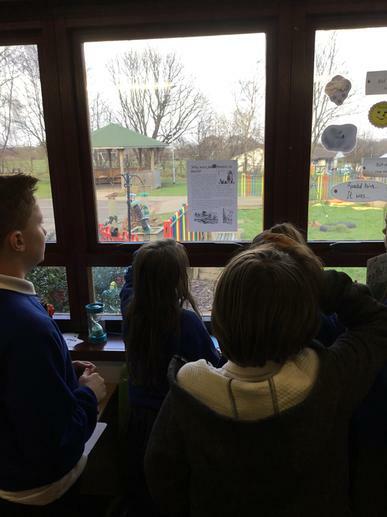 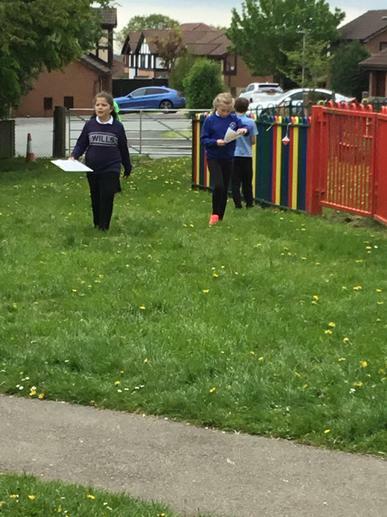 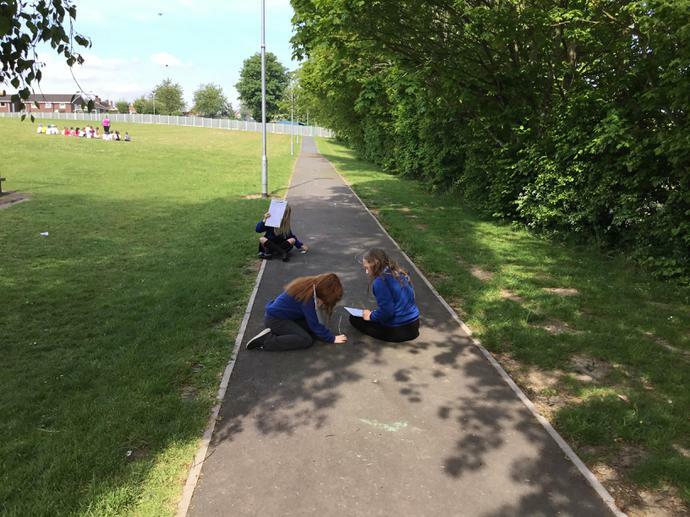 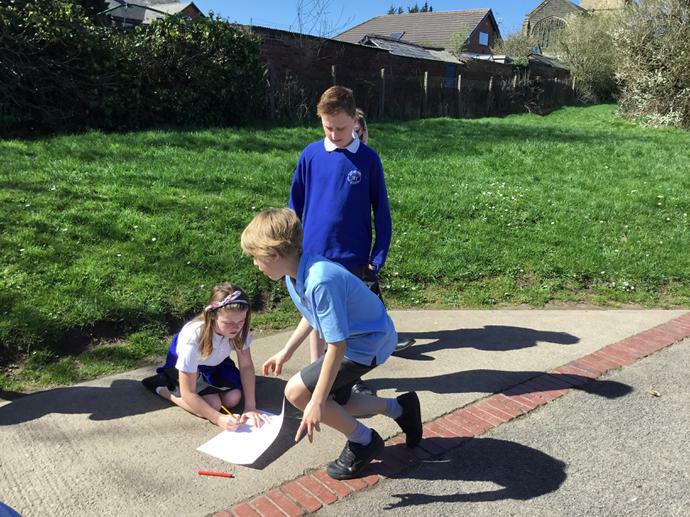 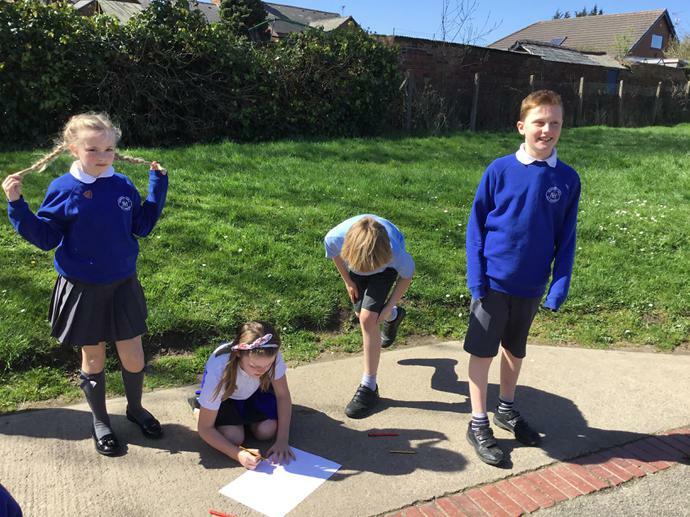 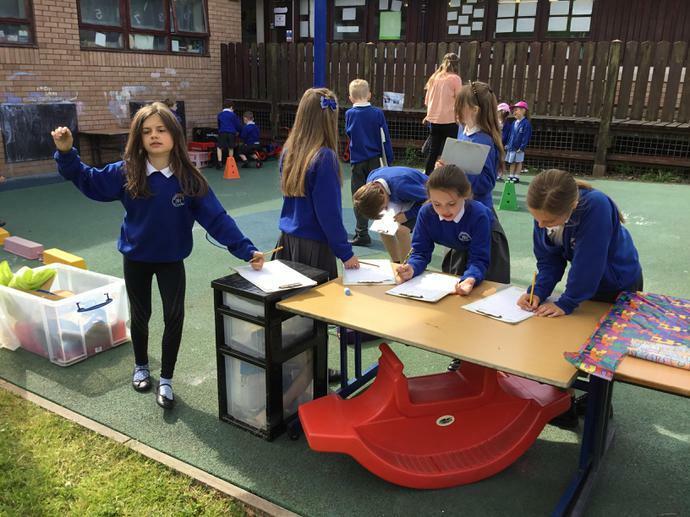 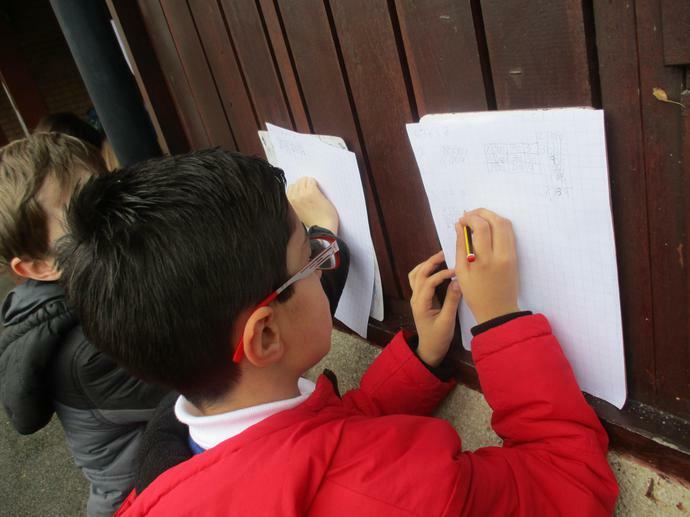 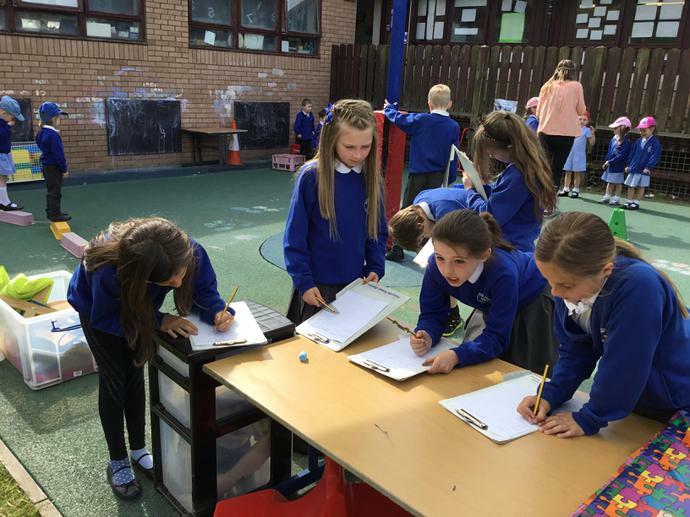 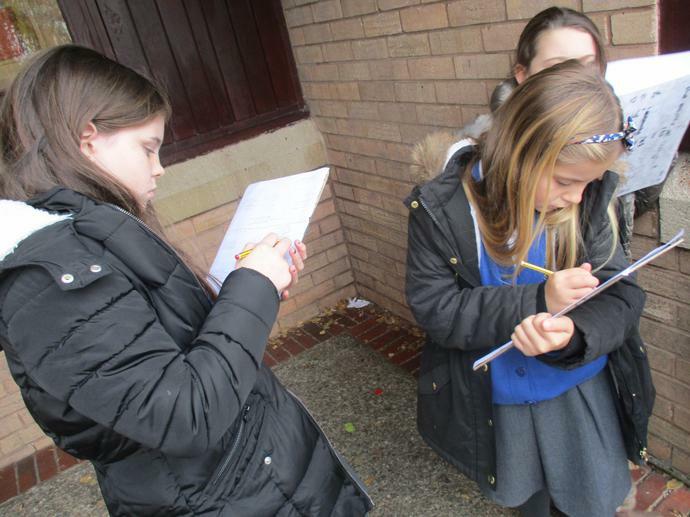 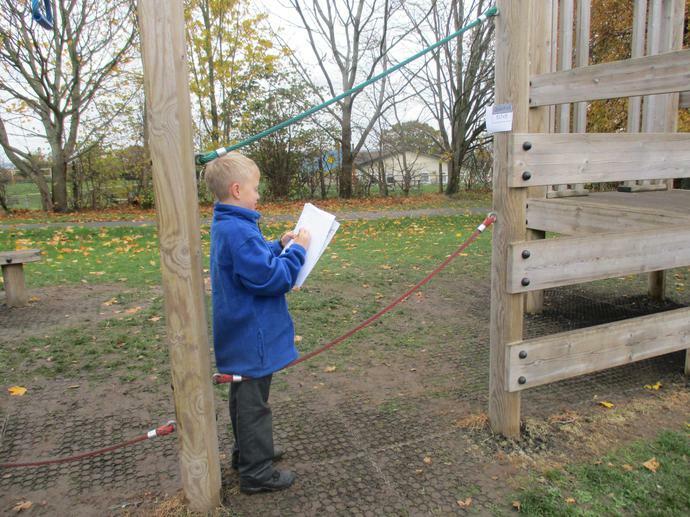 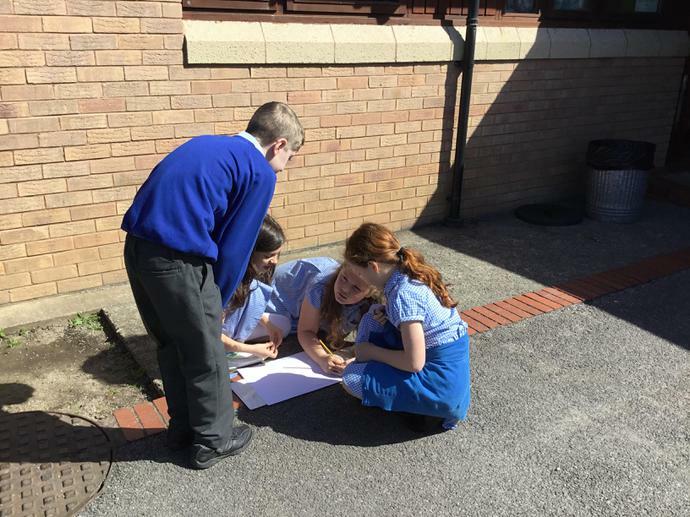 The children took part in a long multiplication hunt around the school yard using their written methods to solve the problems! 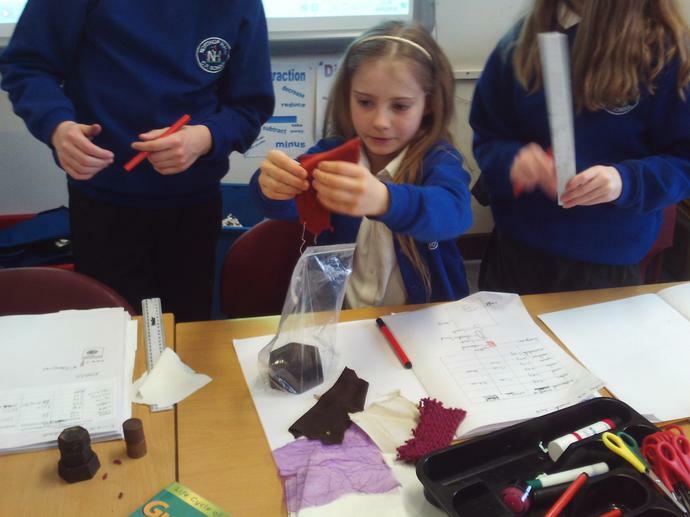 We thoroughly enjoyed our visit to Techniquest this week. 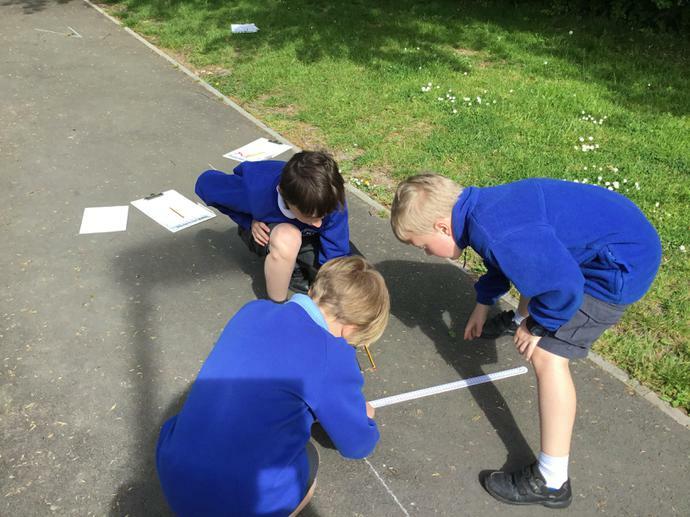 We learnt so much about Light and Space, which was brilliant as it links so well to our current topic. 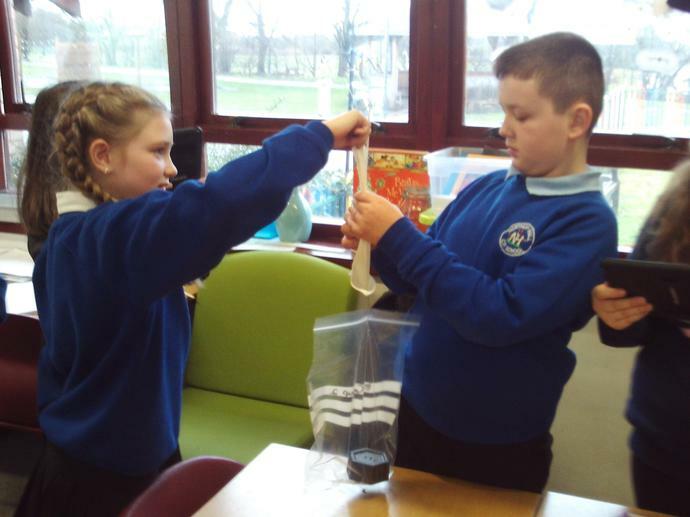 We began the day exploring all of the fascinating scientific gadgets, with our super guide Jack, before heading for lunch. 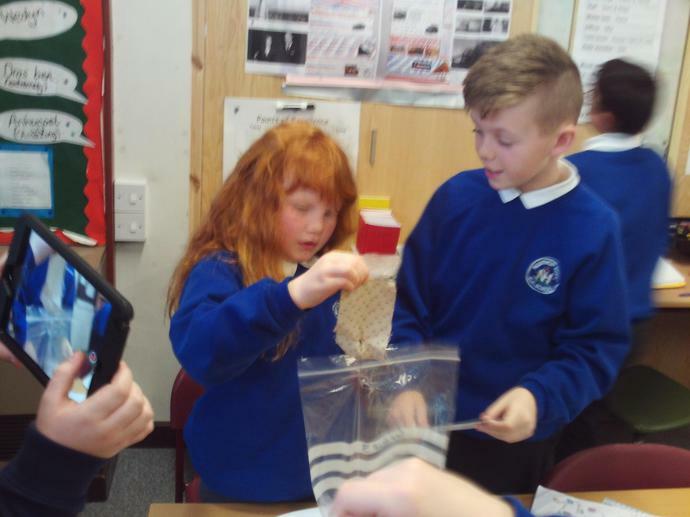 After lunch we headed to the star dome, we had a tour through space and learnt about the constellations, it was a great experience whizzing through space and time. 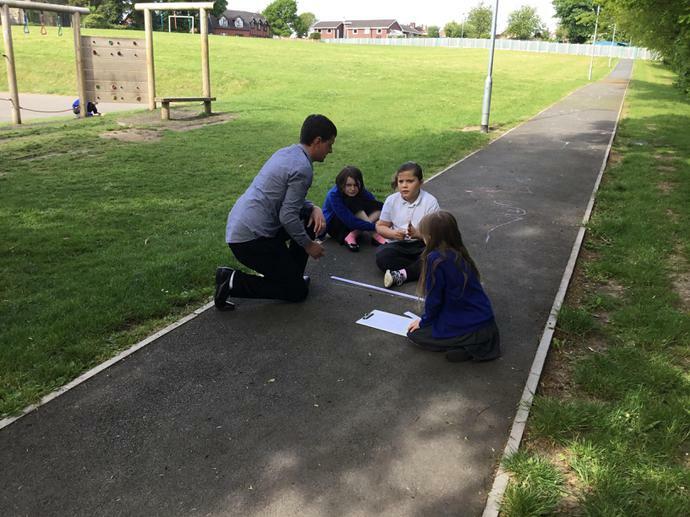 We ended the day with a show about light, we learnt about how light travels in straight lines using lazer beams and smoke and even Miss Bellis got dragged up to get involved! 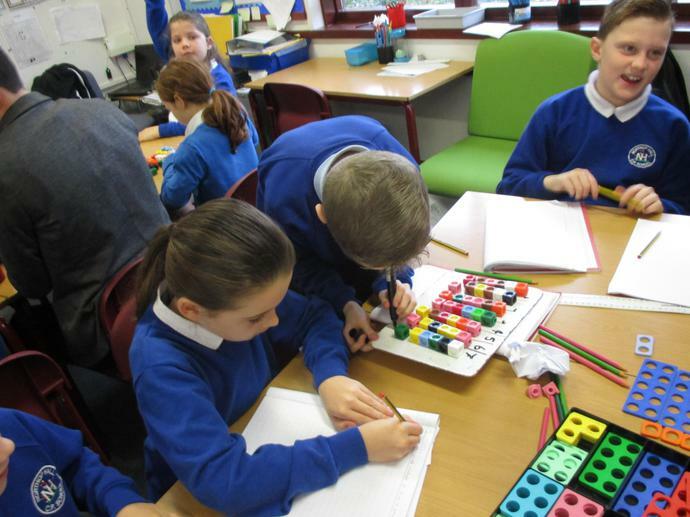 Great fun and lots of learning had by all! 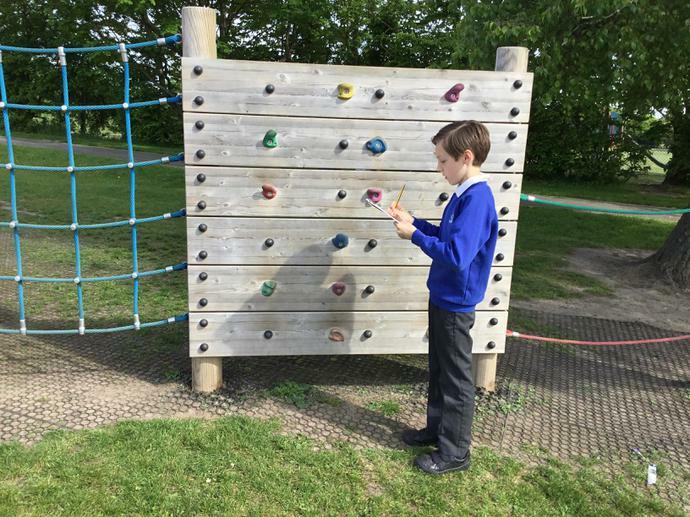 Please follow the link to our Padlet to find out about our highlights of the trip. 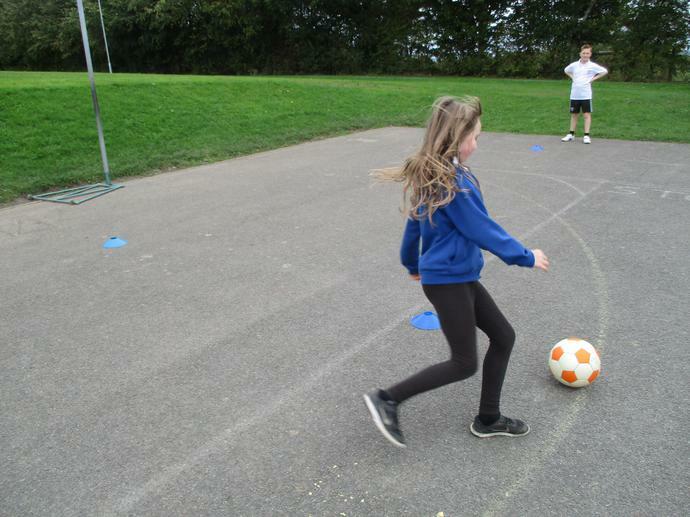 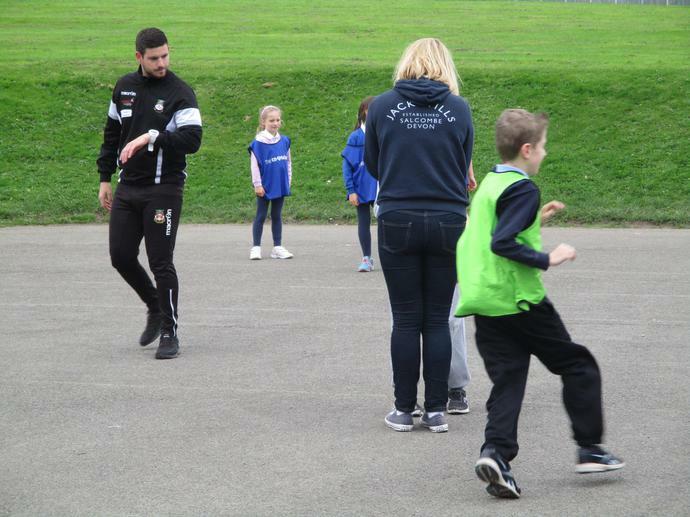 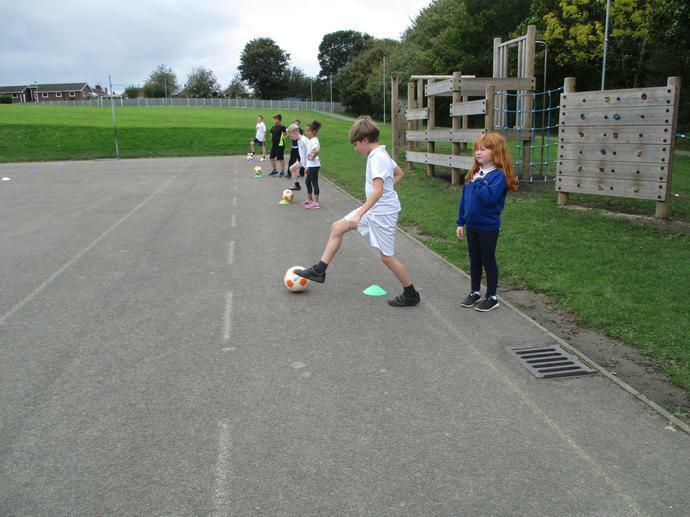 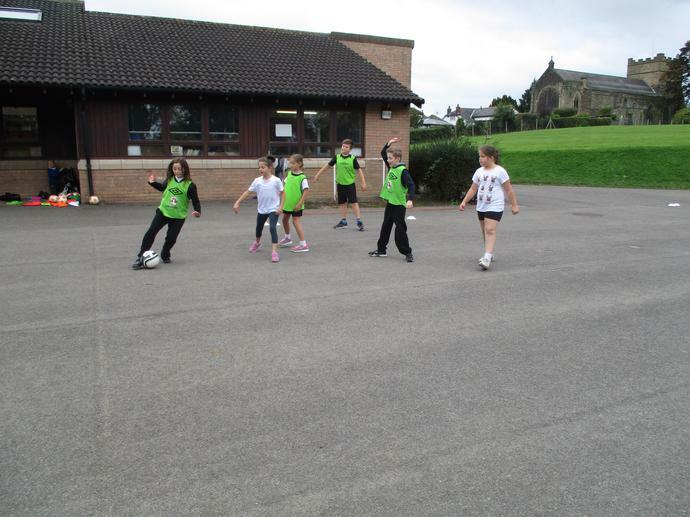 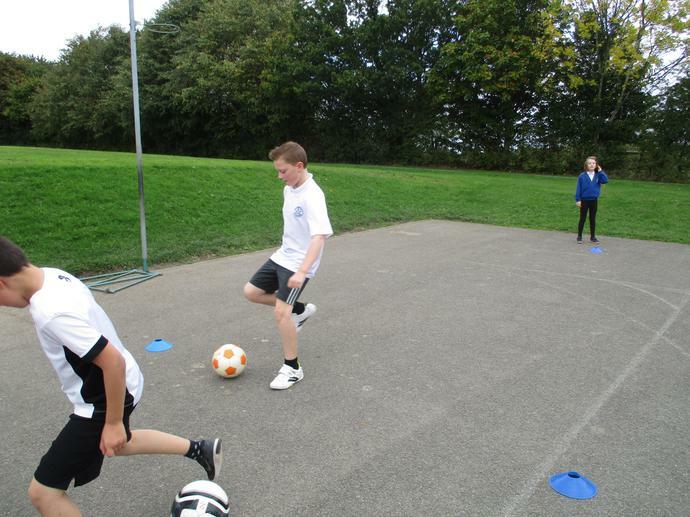 On Monday 16th October we visited Wrexham Fooball Club for our final session of our 5 week education program. 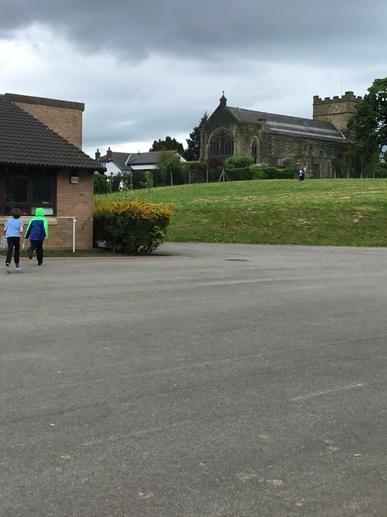 These are the questions and answers which we asked the two Wrexham Players; Mark Carrington (midfielder & defender) and James Jennings (defender). 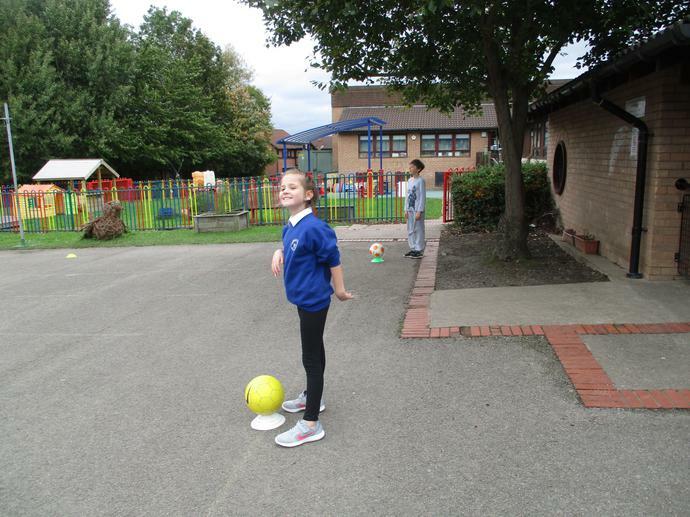 A: Four times a week for two hours a day, plus on a Wednesday we do an extra session in the gym or yoga session for flexibility. 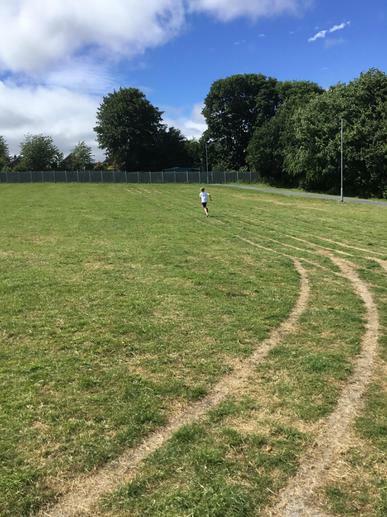 Q: What is the worst injury you have ever had? 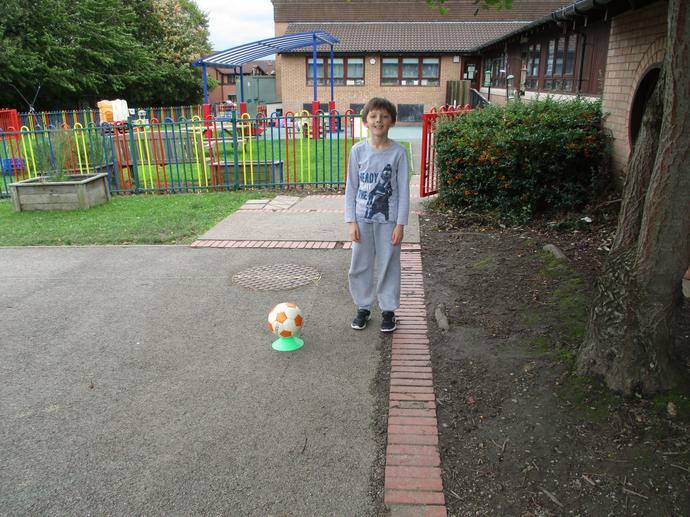 A: James said the worst injury he has had is when he ruptured his knee, he ruptured his anterior crutiate ligament. 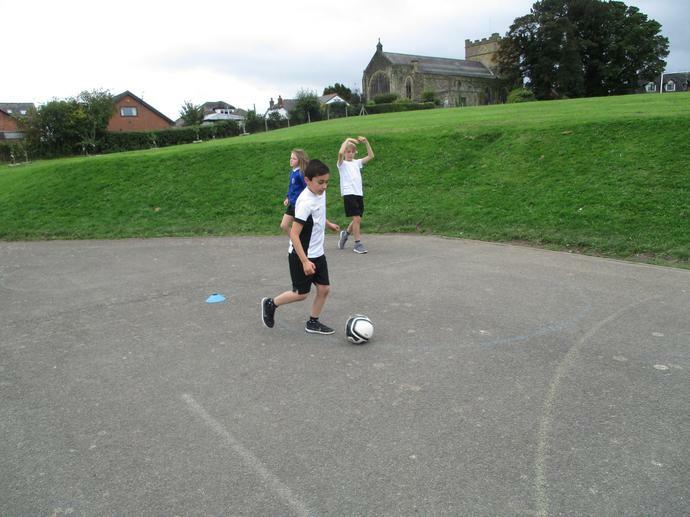 Mark has been injury free but last season he was struggling with his hamstring injury. 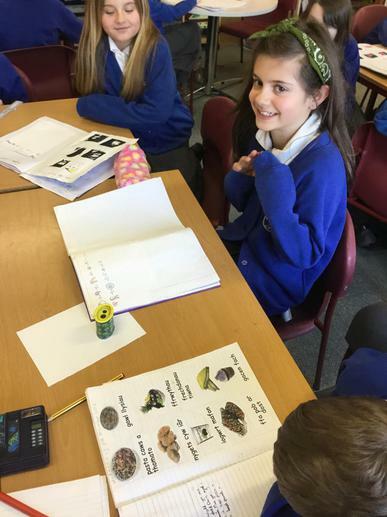 Q: What sort of diet do you have? 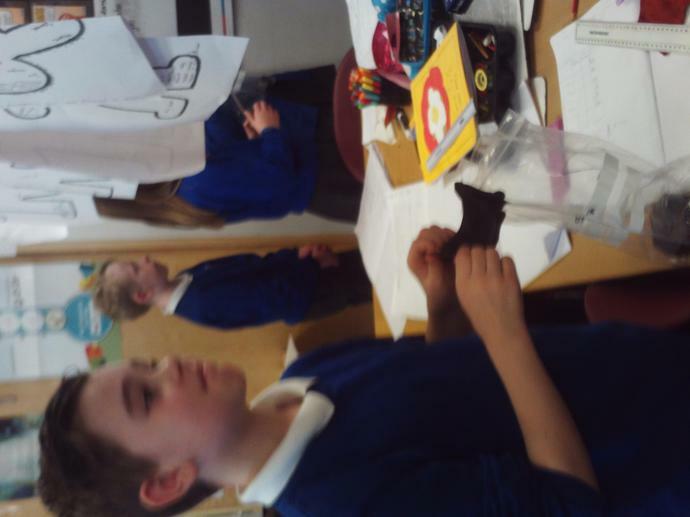 A: Their diet is made up of lots of different things, the main ones; carbohydrates & protein. 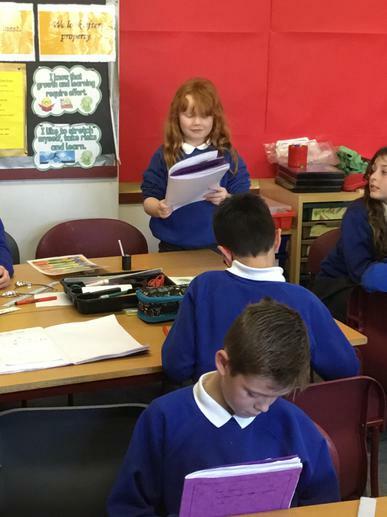 Breakfast is brown toast with jam, cereral, porridge, scrambled egg on brown toast.Lunch is chicken & pasta, chicken with fresh vegetables. 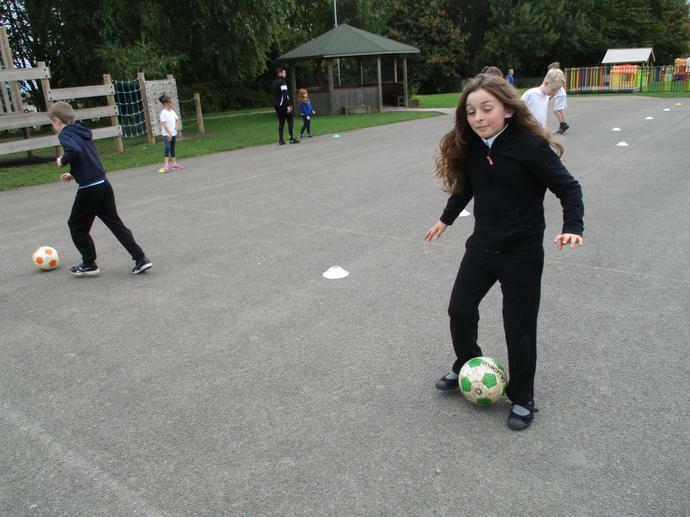 Q: Who inspired you to play football? 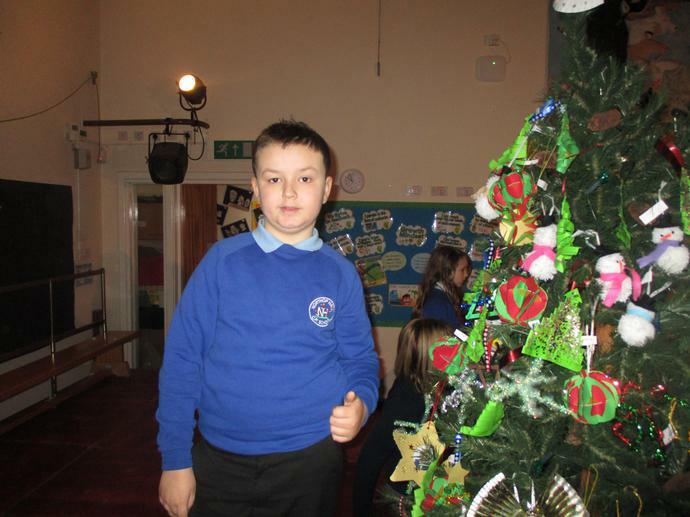 A: Family were the main influence... parents and brothers. 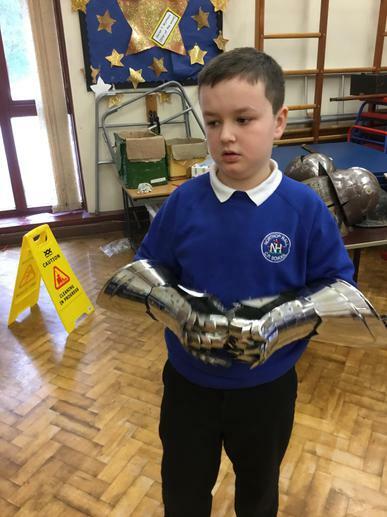 Q: Have you ever had a girlfriend? 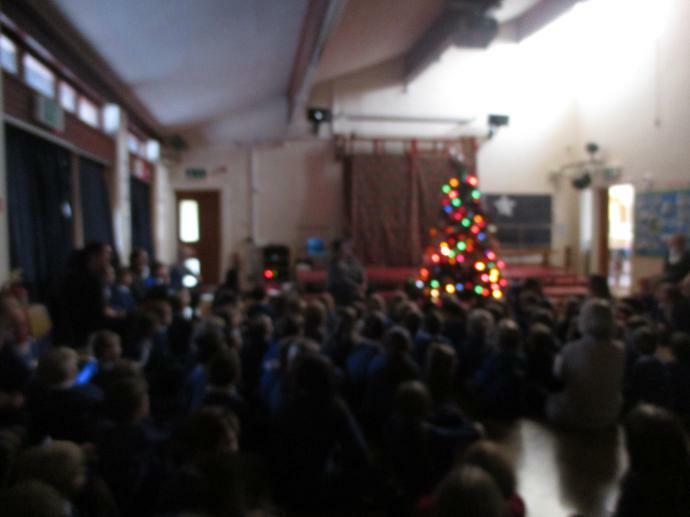 A: The answer was yes.... they are both happily married! 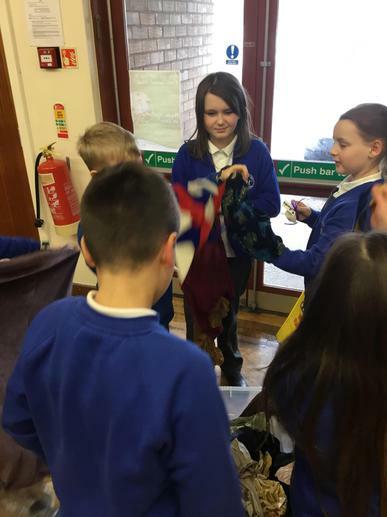 Please could I remind all parents that Year 5 need their kits in school every Monday and Tuesday, but preferably kept in school every week and taken home at half term. 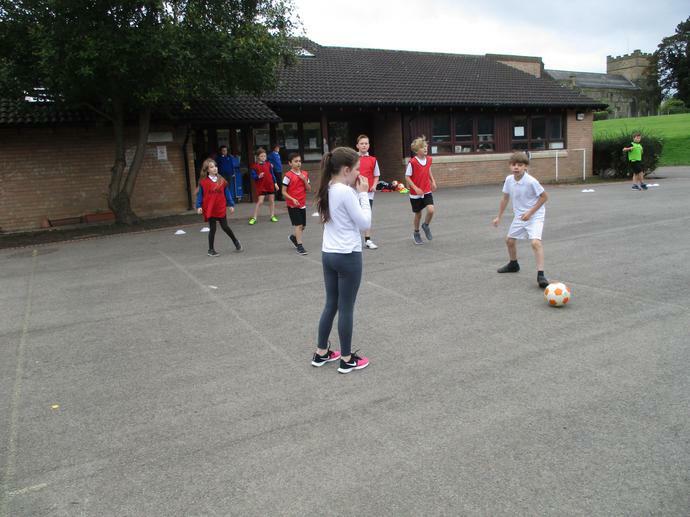 They will need a white t shirt, black shorts and a pair of pumps or trainers. 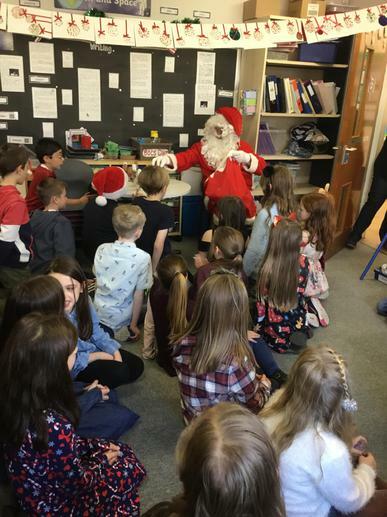 I don't want any children to miss out on such a vital area of the curriculum. 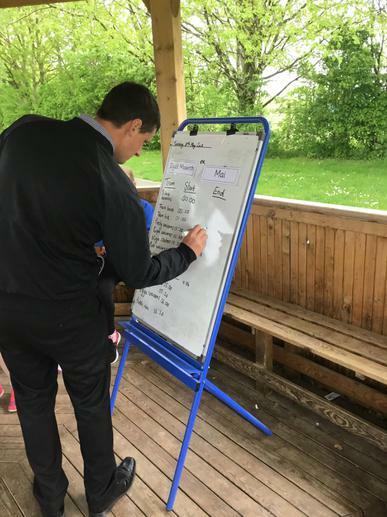 As I'm sure you all are aware we have been receiving maths lessons and football skills sessions from Wrexham FC's football coach Steve for a few weeks now. 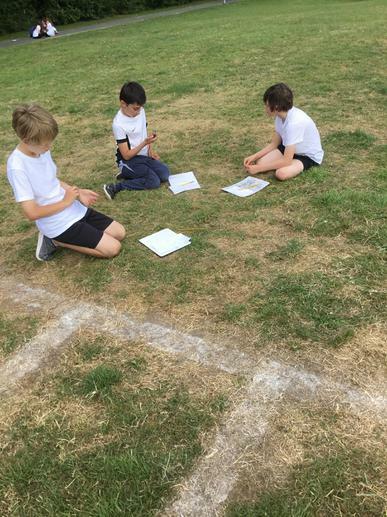 The children are really enjoying gathering football data and representing this in bar graphs and line graphs, as well as pie charts! 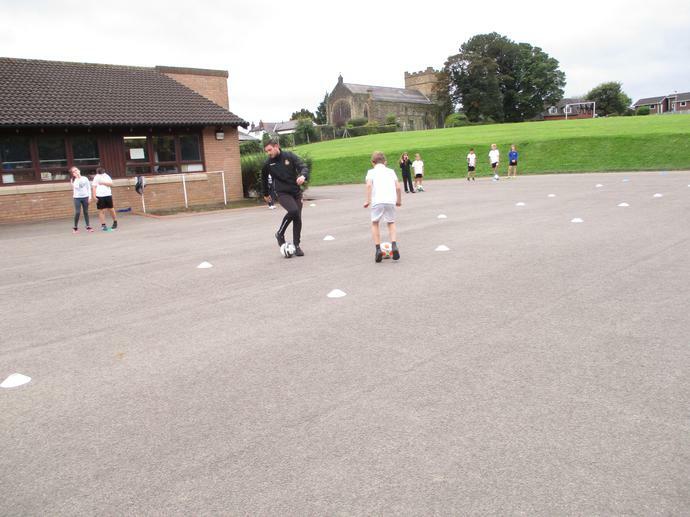 They are also really enjoying their skills sessions with Steve every Monday. 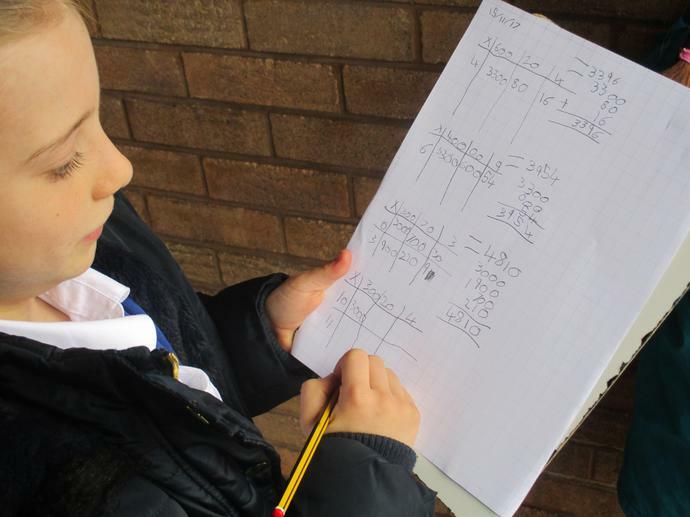 We look forward to our trip to Wrexham FC next week, to continue our maths learning and a tour of the ground. 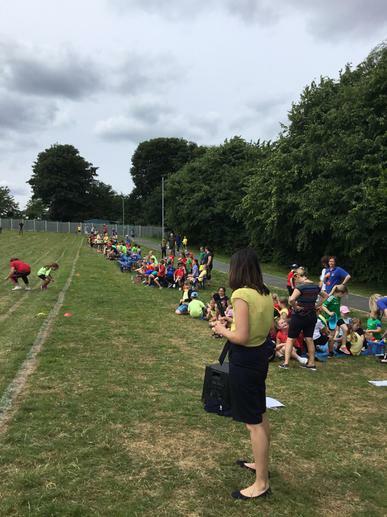 Thank you to all parents who kindly offered to transport pupils to the ground. 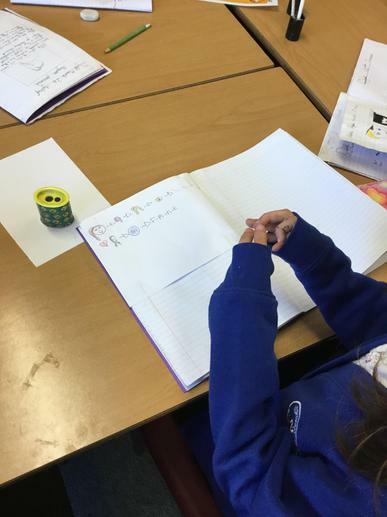 Spellings will be carried out the same as last year, children will have two different coloured books. 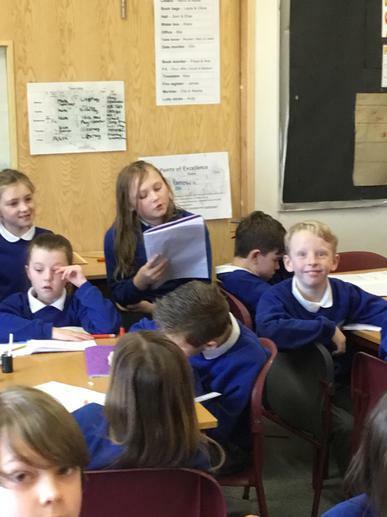 One will be sent home with spellings in to learn (on a Monday) and one will stay in school for the test on Friday. 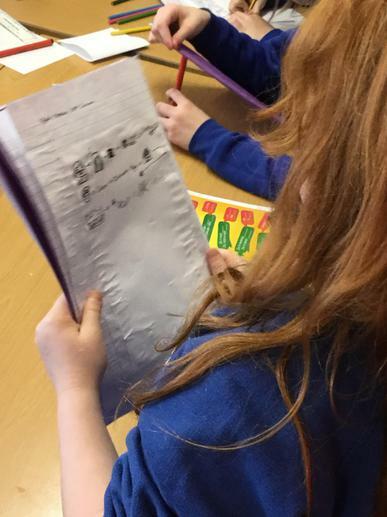 I appreciate your support with helping your children to practice and improve their spelling skills. 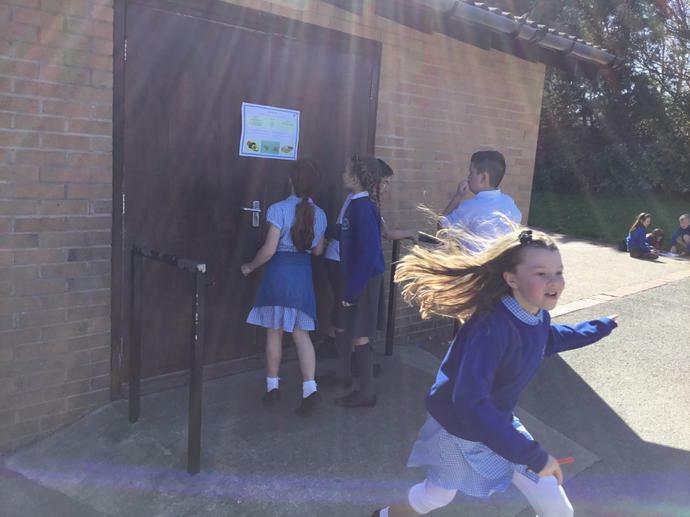 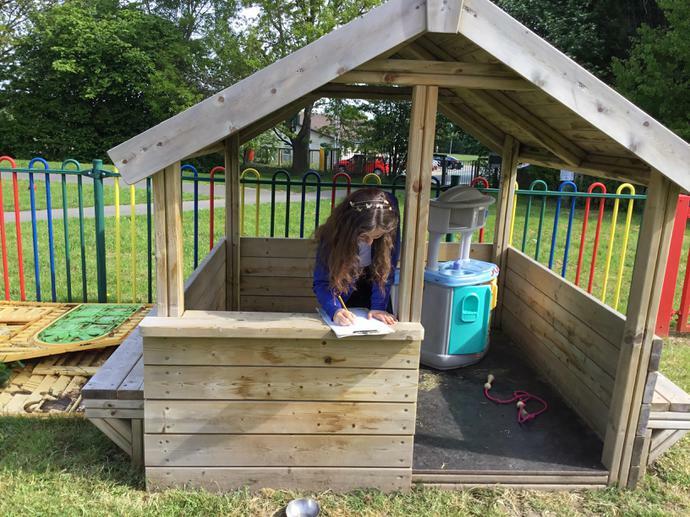 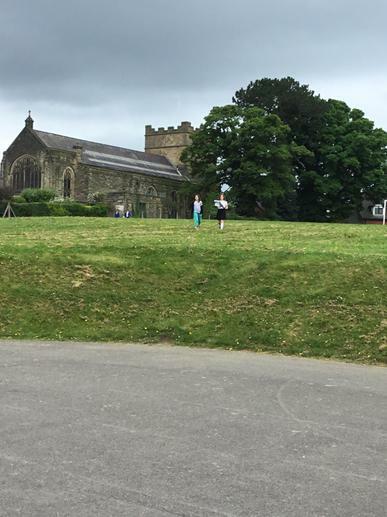 I hope that you have all had a lovely summer break and are ready to begin a new school year in upper Key Stage 2! 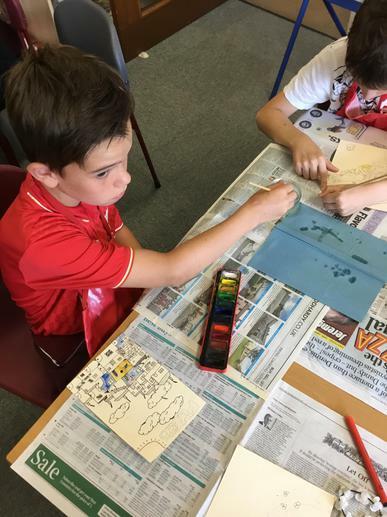 On this class page you will find important information, newsletters, photographs of your child's learning and class announcements.